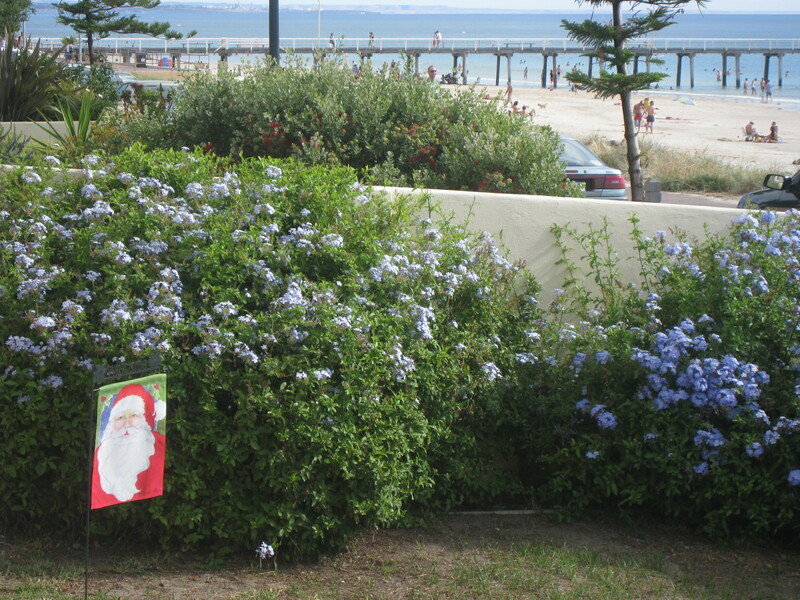 Kathy's Walkandtalkabout | Thoughts, musings and news from my sojourn downunder. 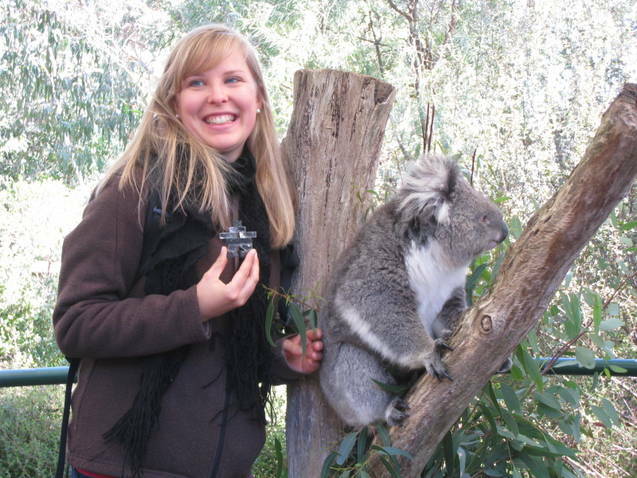 Thoughts, musings and news from my sojourn downunder. I think it’s high time that I continue on with my Walkandtalkabout! 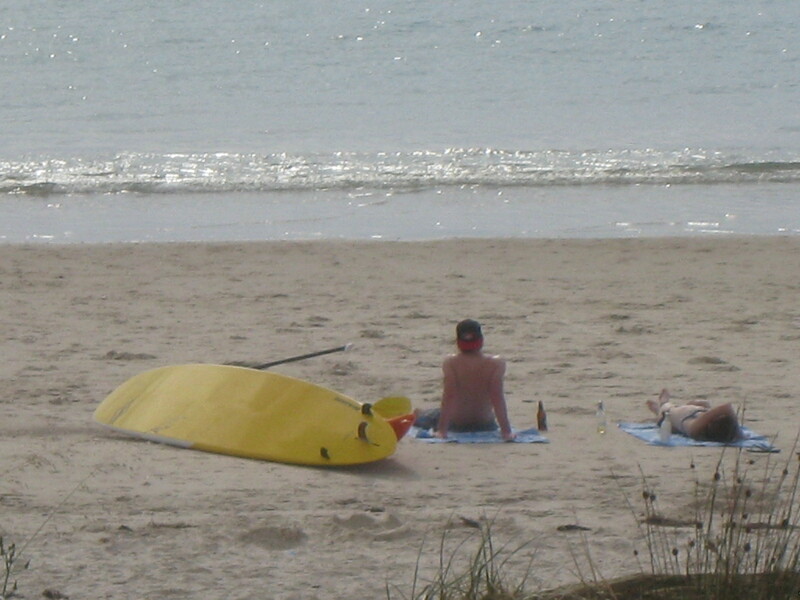 If, for no other reason, to protect unsuspecting visitors from finding themselves in a blog with a picture of me in my bathers and boots. I have been back home in Canada for 6 weeks now, and already there are times when Australia seems like forever ago. When that happens, I like nothing better than to go back and reread past posts and to flip through photos. That’s why it is important for me to continue to write about the special memories I have of our time there. So I’m travelling back four months in time, returning to our road trip to the Red Centre, and more specifically, our travels through the West MacDonnell Ranges. On Noeline’s advice and fine planning, we were booked into the Glen Helen Gorge Resort for a night, following our stay at King’s Canyon. While the distance between Kings Canyon and Glen Helen Gorge is only 225 kilometres it, nevertheless, took us approximately ten hours to cover it. There was a lot to see along the route, and we intentionally took quite a roundabout way of covering the distance in order to see and do as much as we could. 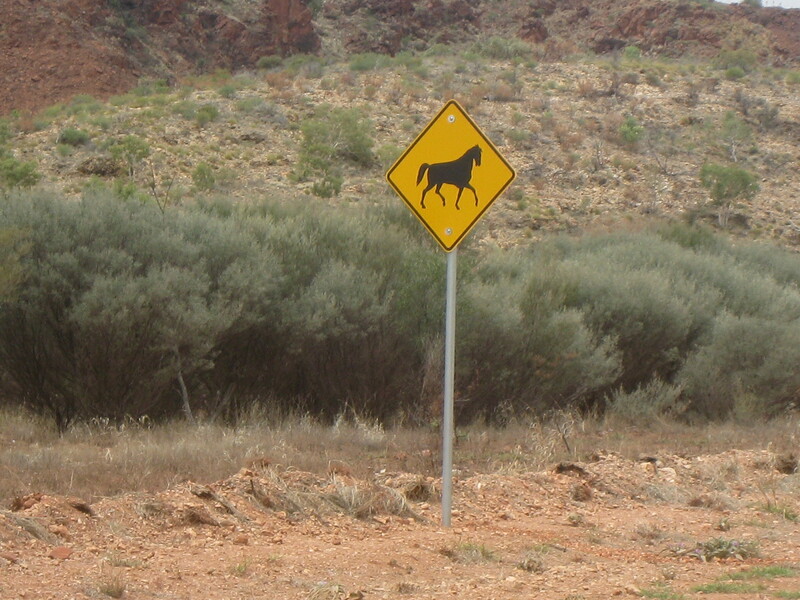 Part of the trip was by way of Red Centre Way and the Mereenie Loop Road. Much of this road was unsealed and therefore, wet and muddy. 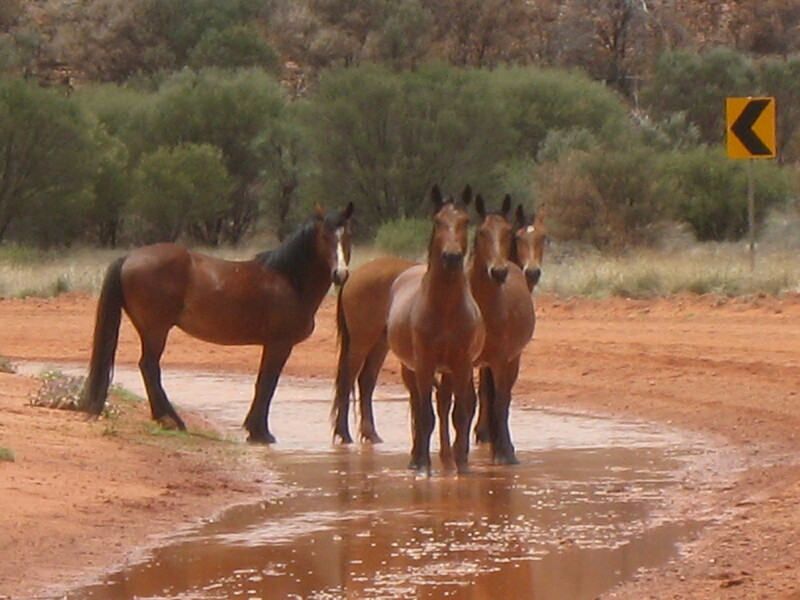 It was along this section that we came across so many herds of wild brumbies ambling along the wet road. From Mereenie Loop Road we then took the Larapinta Trail and stopped at historical Hermannsburg, a Luthern mission established in 1872, and handed back to the Aboriginal people in 1982. The old mission’s buildings have since been restored to their 19th century condition and today welcomes visitors to its’ museum, church, school, tannery and tea room. Along that same route we visited Wallace Rock Hole, a small but thriving Aboriginal community and also ventured as far in as the wet road allowed us, to Palm Valley, a lush oasis of slender palm trees in the middle of a very dried up Finke River bed. By this time, it was nearing the end of the afternoon and we didn’t want to be travelling the outback roads in the dark, so started heading towards our destination, Glen Helen Gorge Resort. As the sun was sinking lower, we made one more stop along the way at Gosse Bluff. 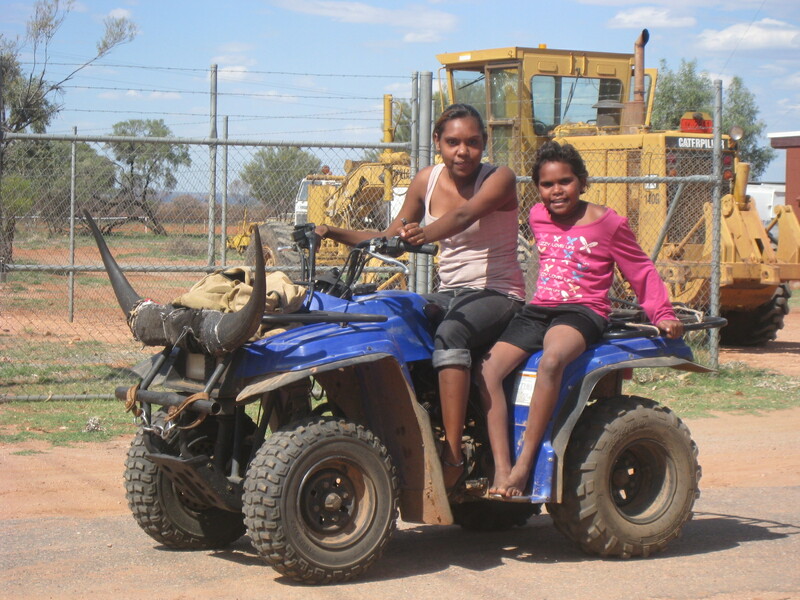 Some after school fun for two girls in the community of Wallace Rockhole. 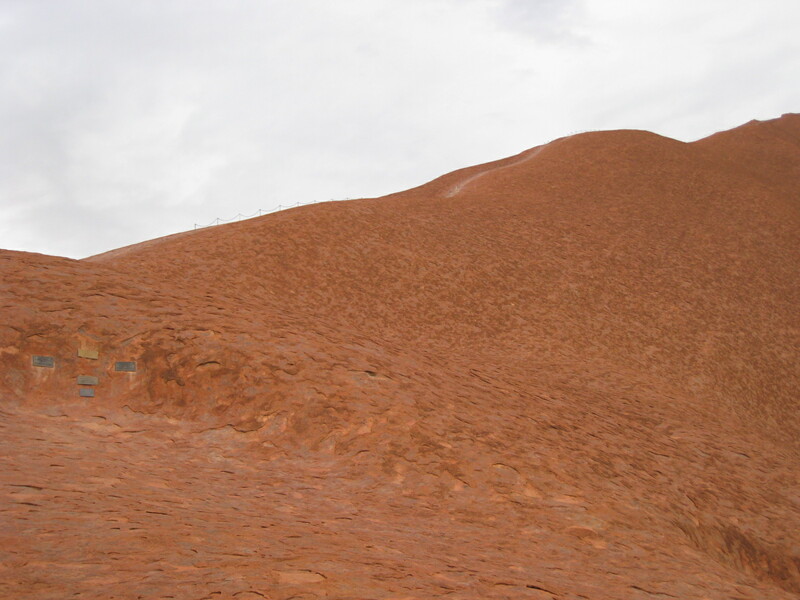 Gosse Bluff, or Tnorala, as it is known to the Arrernte people, is a ring of rugged red hills approximately 5 kilometres in diameter, and is what remains of a 140 million-year-old meteorite crater. Geologists and scientists have a scientific explanation for its existence. According to Aboriginal Arrernte beliefs, though, the crater was formed as the result of a baby in a basket falling from the heavens, down to earth. It is said that the stars of the milky way were celestial women dancing. With them was a baby, asleep in a basket. As the dancing became livelier, the basket rocked and fell from the heavens down to earth, hitting with such force as to push the earth around it up and the baby and basket became buried deep down under the rubble. The site now is a highly sacred site in Arrernte law, and not because of the legendary creation of the crater. The story, as passed down from generation to generation, took place long before the arrival of the white man. At that time, a local Aboriginal tribe lived amid the crater. One morning, a tribesman climbed up over the rim to hunt kangaroo. He returned at the end of the day to find all of his people killed and knew that it had been a desert tribe from the south responsible for the killings. He went in search of the rest of his family living in the nearby ranges, and with them sought out the killers in order to avenge the death of his family members. 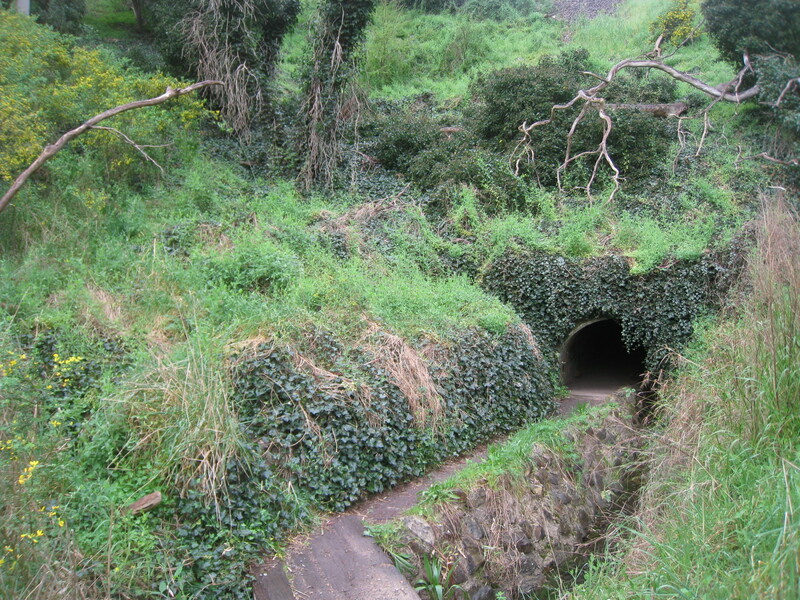 As a result of those tragic events, the original landowners have since regarded the site of Gosse Bluff as a “sorry place”, and no one has lived there since because of the sorrow over the lost family. Today, the Aboriginal custodians of the land ask visitors not to camp on the site, out of respect for those who passed away on that land. Difficult to get a picture of the entire crater from within, the above represents a small section of the rim which forms a circle with a diameter of 5 kms. While heavily eroded over millions of years, it still rises starkly 250 metres above the plains. I have to say that I genuinely sensed an eery or haunting aura in the silence that hung around us in the early evening air. What bothered us more, though, was that we were not the only ones there. There was an older gentleman camping there for the night. To say that he was a bit of an odd duck would be an understatement. He had bicycled there, by himself, from as far away as Perth, Western Australia, through the bloody outback. According to my research, he’d already cycled at least 2000 kilometres, and was intent on cycling to Brisbane on the east coast, another 3,000 kilometres. Stephen, being the cycling nut that he is, talked to him at great length and checked out his equipment. His assessment was that the man was riding a “Canadian Tire” quality road bike, towing a cheap trailer behind, hauling his belongings (camping, cooking gear, food, clothes and water). It was unbelievable, really. What bothered us the most, though, was that he was camping on this sacred “no camping” land! We shuddered to think what might happen to him, and to this day wonder about his well-being. Before we left him, as night was approaching, Stephen gave him our supply of energy bars and some water that we had brought with us for our trip, and silently we went on our way. We were now only 55 kms from our destination, Glen Helen Gorge Resort. The sun had set and darkness had settled in. We drove the rest of the way, slowly, on edge, thinking about the strange man, the eery landscape we had just visited and watching out for wildlife on the dirt road. We were tired, hungry and overwhelmed by all that we had seen, done and learned that day. Driving in the lane to our accommodation at approximately 8 o’clock, it felt like we had arrived home. It was dark, so we weren’t able to appreciate where we were, but we walked into a rustic lodge, full of friendly faces and delectable smells emanating from the kitchen. 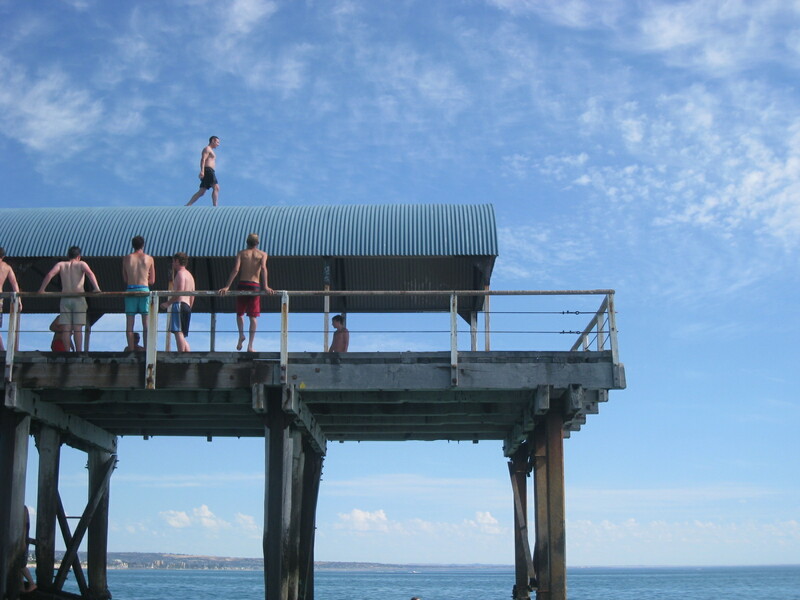 Okay, so why have I titled this post “Brothers Island- the Downunder Version”? I’m afraid I’ve rambled on and on, and haven’t made it to the point of my story. Nevertheless, I’ll leave it as such because I want to share the story of Gosse Bluff, as it really left an impression upon the three of us. So this post will have…to be continued…please stay tuned. It has been too long. Where did I leave off? Back to our journey to the Red Centre. Following our visit to Uluru and our two stopovers in Coober Pedy, we set out towards the West MacDonell Ranges by way of Kings Canyon and the Mereenie Loop Road. The land through which we travelled is all Aboriginal owned and has some of the most spectacular landscapes and rugged beauty that I have ever seen. We passed by and through many communities where Aboriginal life remains strong and learned of fascinating natural features which the traditional land owners hold sacred. Many of the roads are unsealed and due to the rain that had fallen prior to our visit, some were unnavigable, even with our Rav 4 AWD. We spent a day hiking the rim of Kings Canyon. The six kilometre loop begins with a steep climb to the top of the canyon and then follows the canyon rim, providing breath-taking panoramic views in all directions. Unnerving at times, there is nothing there to stop you from falling over the steep cliffs except your own sense of fear. As such, you have to determine your own comfort level with respect to just how close you want to get to the edge to admire the view below. It’s a precarious line. Forunately, it was a stinking hot day with no wind to add to the drama. We stopped frequently for photos and then for a lunch break at the Garden of Eden, a gorgeous area at the bottom of the canyon with a cool waterhole and lush riverine vegetation, very much an oasis in the otherwise dry, rocky canyon. We spent a couple of days there, and then drove further north along Namatjira Drive towards West MacDonnell National Park . 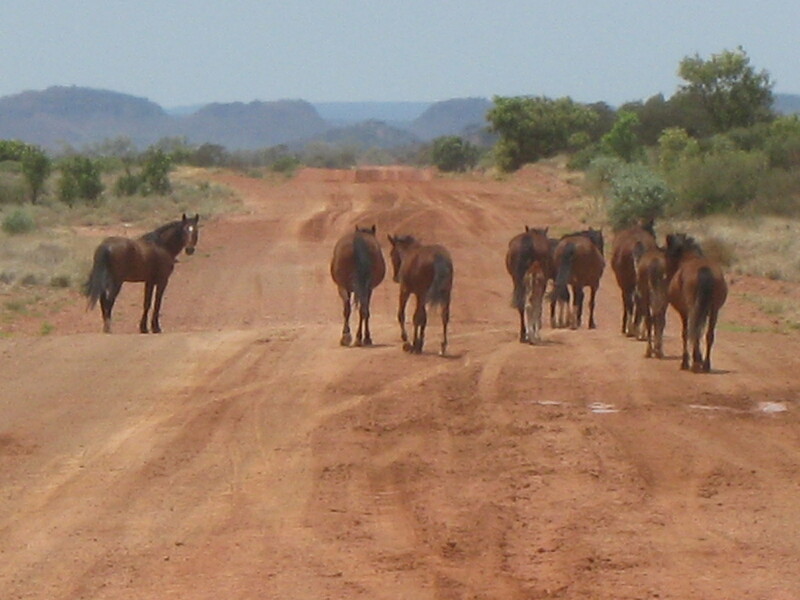 The drive is spectacular in itself and en route we came upon several herds of brumbies as well as some donkeys and dingoes. 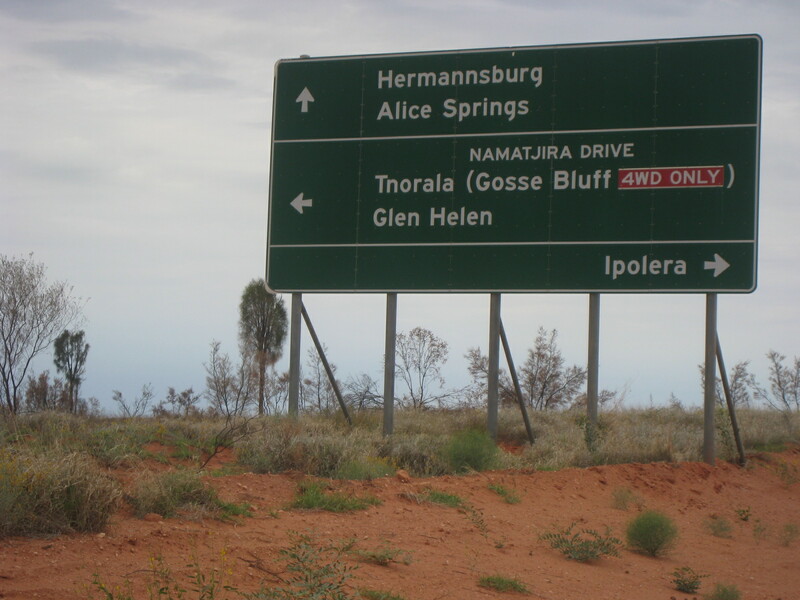 Namatjira Drive is 157 kms long and runs along the southern boundary of the National Park. Within that relatively short distance, though, I discovered places which have since become my most favourite places in all of Australia. 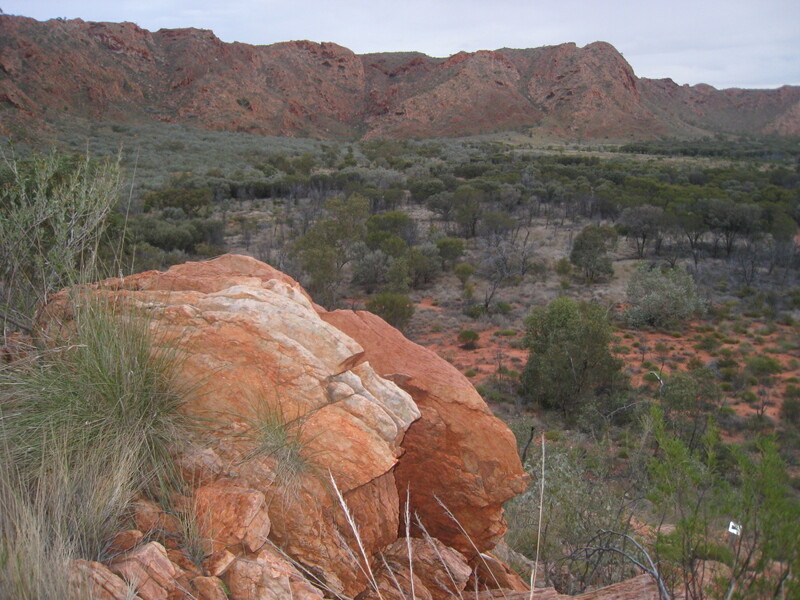 They include Glen Helen Gorge, Ormiston Gorge, the Ochre Pits and Ellery Creek Big Hole. Images of these places will forever be etched in my memory where I will be able to revisit them whenever I like. I will save Glen Helen Gorge for another post, but will share the other three spots with you now. The weather was perfect for exploring the Red Centre. Under the hot sun, the roads were drying up nicely from the previous rains. 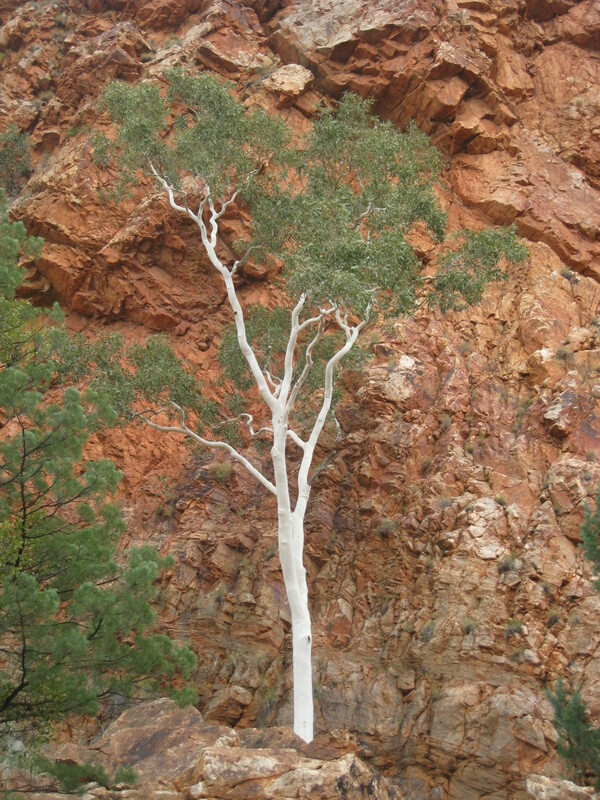 We visited Ormiston Gorge early in the day. Located 135 kilometres west of Alice Springs, the towering red walls of the gorge surround a cool, pristine waterhole. There are several good hiking trails. 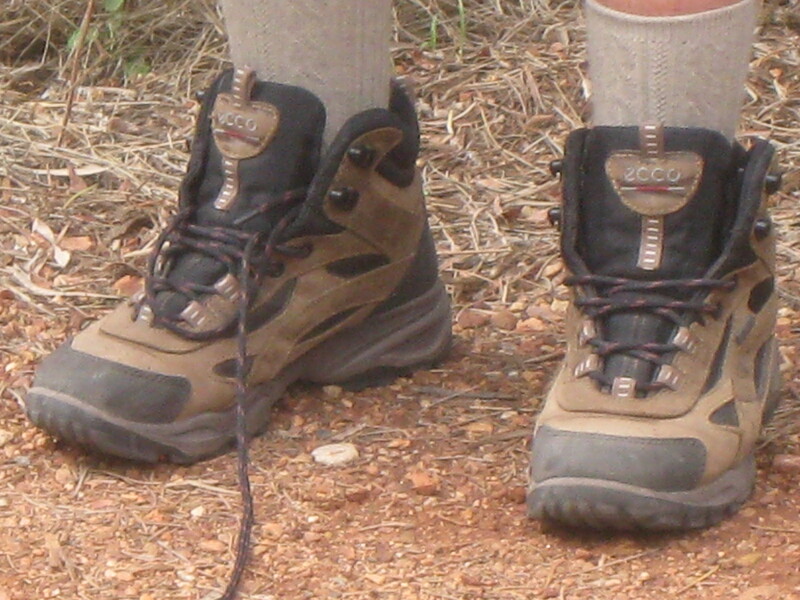 We chose to do the Ghost Gum hike. The one and a half hour loop took us up to a viewing platform and then brought us back down to the waterhole. We lunched along the trail sitting on a rock overlooking the gorge and when we wound up at the waterhole, enjoyed a surreal swim. Refreshed from the dip, we put our hiking boots back on and headed to Ellery Creek Big Hole. 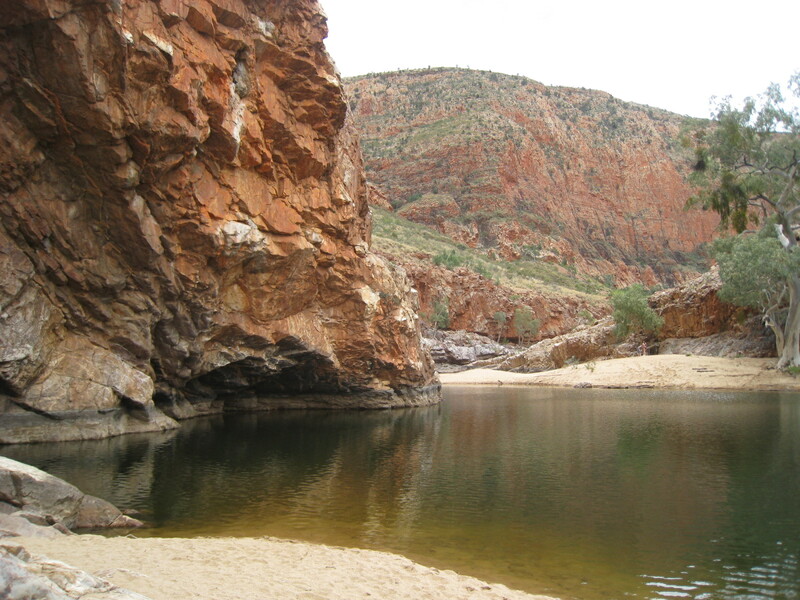 Ellery Creek Big Hole is a spectacular waterhole in the impressive Ellery Creek, which cuts through a gorge in the West MacDonnell Ranges. 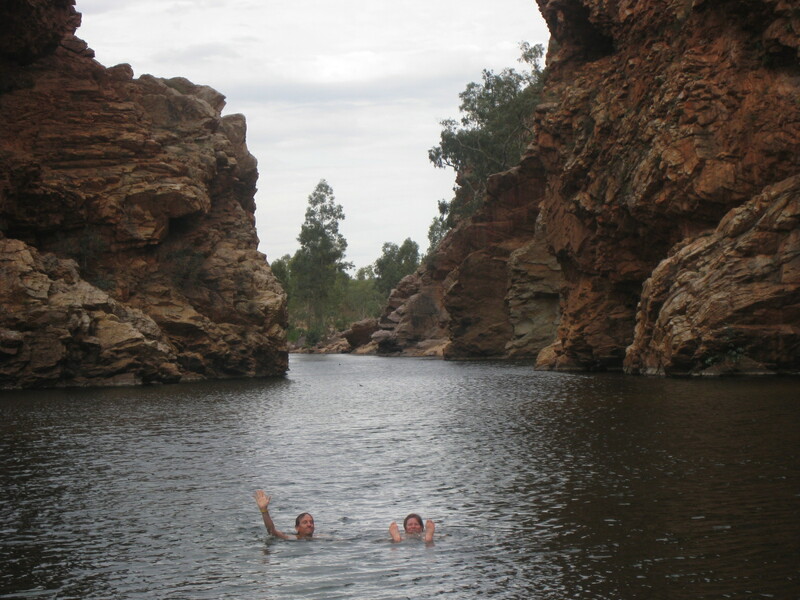 Thousands of years of massive floods have carved out a beautiful swimming hole surrounded by stunning cliffs. We arrived in mid afternoon, under a scorching sun, and couldn’t have found ourselves at a more perfect place. The water was surprisingly cold, at least by Australian standards, beautifully refreshing by Canadian standards. Immersed in millions of years of creation, there was a slightly eery presence to the place. It would not have surprised me to come upon a prehistoric sea serpent in the deep, (some say bottomless), waterhole. We finished the afternoon off with a visit to the Ochre Pits. The pit consists of many layers of soft, multi-coloured vivid rock, in shades ranging from gold to crimson. 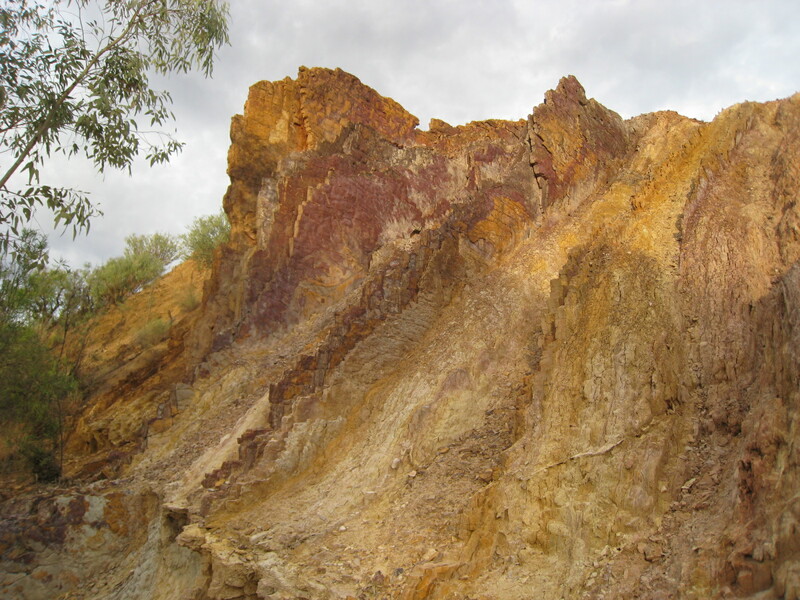 The mine belongs to the Western Arrernte people and the soft colourful rock, considered to be some of the choicest ochre, was and still is, mixed with emu fat and used as body paint for traditional ceremonies. In late afternoon, as the sun was starting to sink lower, the earthy colours intensified. It was absolutely stunning. It’s difficult to describe the feeling that all of these sacred sites evoked in me. I think the words solemn and spiritual come closest to capturing it. It is as if you could feel the presence of generations and generations of Aboriginal elders watching over and protecting their sacred land and the people and laws within it. Hopefully my photos will help to convey both the beauty and the feelings. I have to thank Noeline for guiding us to these sites. They are certainly not as well known as many of the other natural attractions in Australia, and are a little off the beaten path. In a selfish way, I am glad of that. For much of the time that we spent at each place, we were often the only people there, which certainly added to the experience. And while not as well known, I found them to be every bit, if not more, impressive. Many thanks, Noeline. My sincere apologies for posting this picture, but it will always remind me of an epic day of hiking and swimming in some of the most gorgeous places in Australia. 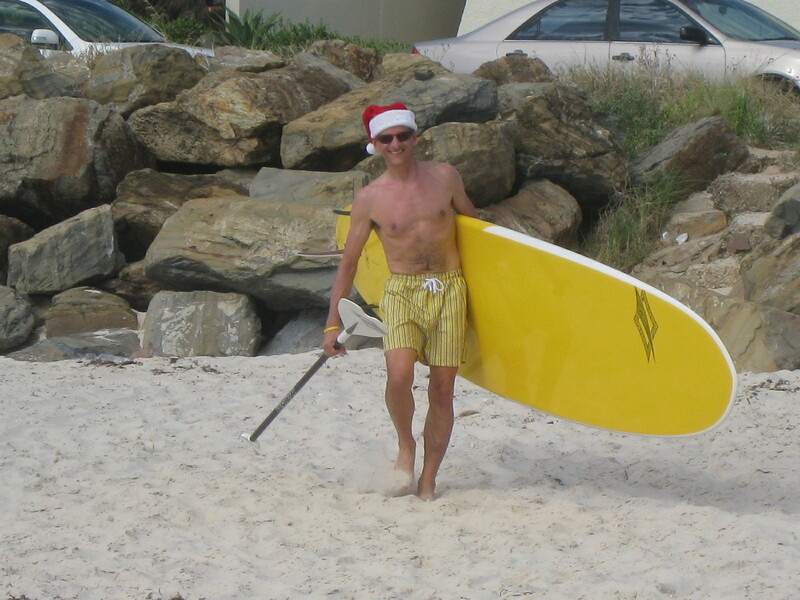 Way behind in blogging, but Christmas greetings take precedence. From our house to yours, a very Merry Christmas! 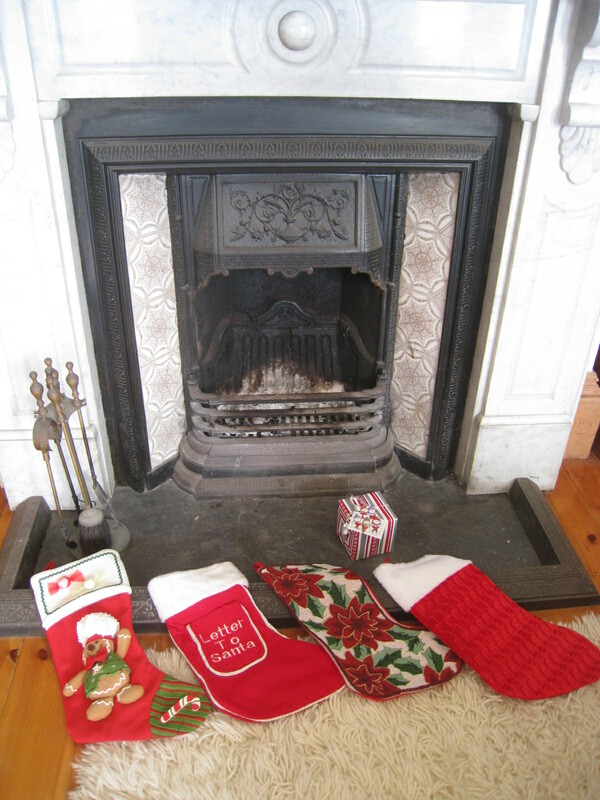 T’was the day before Christmas…. In hopes that St. Nicholas (Stephen) soon would be there. While visions of (nice bums) danced in their (Eric’s) head. Every time I revisit a place I’m provided with the opportunity to discover new things about it, become more familiar with it, and develop a greater understanding and appreciation for it. A natural outcome of this is that I develop a stronger attachment to that place. 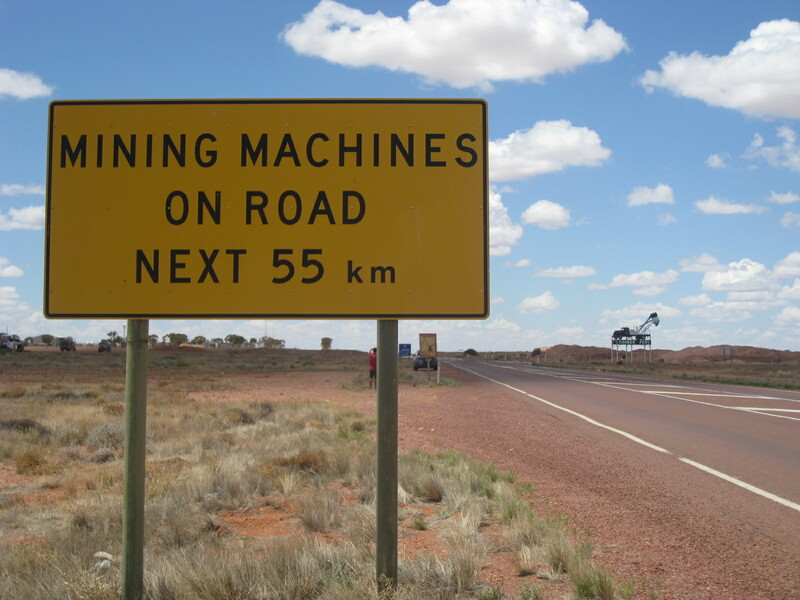 This has never been more apparent than during my recent revisit to Uluru. When Sharon, Kelly and I visited Uluru in February, we participated in a guided walk with an Aboriginal guide, Sammy, who, among other things, shared with us the importance and significance of Uluru to the Anangu people. 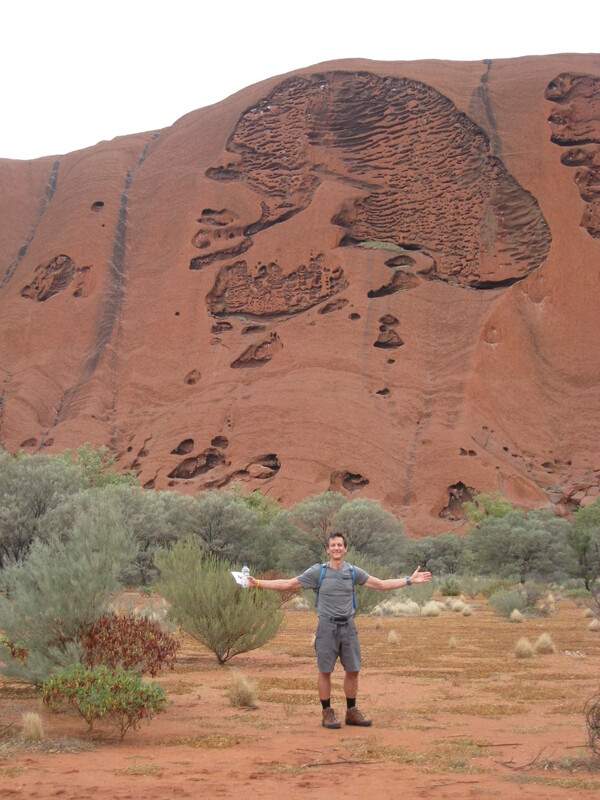 He explained to us that Uluru is, and has always been, a sacred place for his people. He told us that each special feature on the rock is a story linked to creation, left by their ancestors. As such, these physical features are equivalent to a sacred scripture. This has been passed down from their ancestors for as long as the Anangu have been there and continues to be passed on today from grandparent to grandchild. 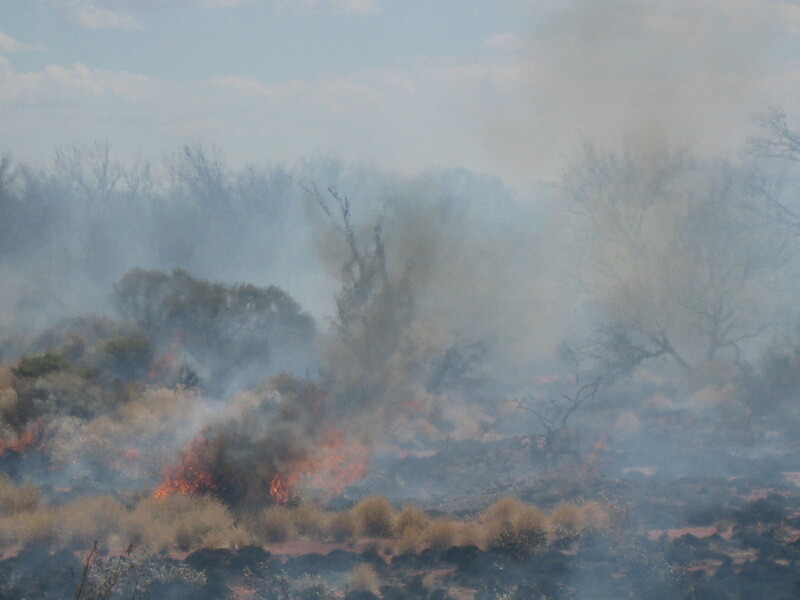 This is a part of what the Anangu refer to as Tjukurpa. (The video clip below will give you a better understanding of Tjukurpa than I ever could). 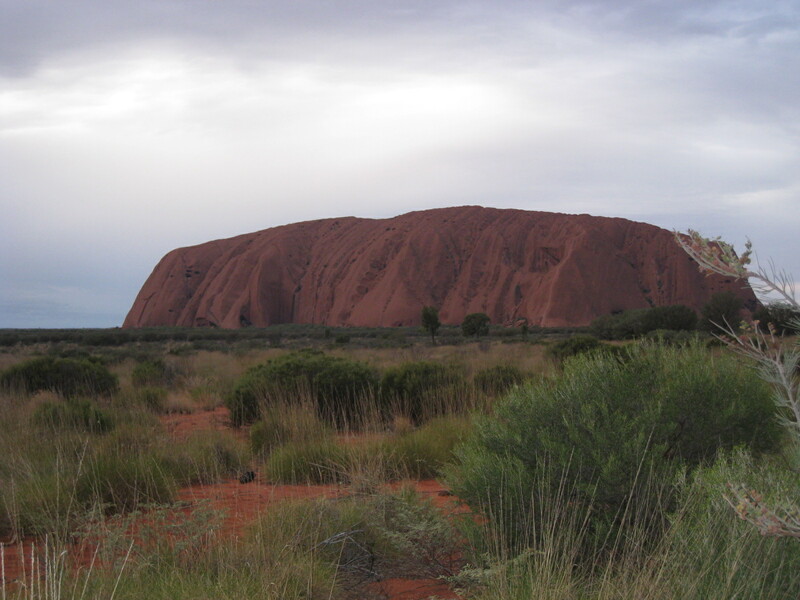 The Anangu welcome visitors to their land and are pleased to help visitors understand more about their culture, and in return, ask that we, as visitors, respect their land, spiritual laws and culture. That includes not climbing the rock, Uluru. This message is also passed onto visitors through the Cultural Centre in the park and in the Visitor Guide that is handed out upon entering the park. This seemed like a very reasonable request to me, and perhaps, in my naivete, I just assumed that visitors to the site would honour and respect their culture and rules. So on that first visit, I really was unaware that this was even an issue for some. On this last visit, after reading and hearing the message again many times upon arrival, Stephen and I set out on our afternoon hike around the base of the rock. I was shocked to come across a point in the hike that had signs posted saying that the “..climb would be closed today..”, because of the recent rain, apparently making parts of the climb slippery. The mixed message that this sign gave off was totally baffling to me. It suggested that on other days, it would be just fine to climb the rock. To add insult to injury, I looked up at this point, to the wall of the rock in front of me, and could clearly see a worn path in the rock made from years and years of tourists climbing it. Even worse, installed alongside that worn path, were a series of metal posts drilled into the rock with a chain running down the length of the posts for climbers to hold on to. It got worse. In my opinion, cultural reasons are significant enough reason to close the climb, but in addition, there are also safety and environmental reasons in support of an outright ban. More than 35 people have died attempting the climb and many more injured. Not only do these attempts put the lives of climbers in jeopardy, but it also puts the rescue workers who are called in to help, in a risky situation. I’ve done some looking into the whole climbing issue since I’ve returned home. I am utterly stunned by the numbers of people who continue to climb the rock in spite of the Anangu’s request. The good news is that today, fewer people are climbing Uluru and in the last survey the park conducted, the general reason why people had chosen not to climb was to honour the traditional owners’ request and their desire to show respect for the Anangu people and their culture. The sad news is that it is estimated that there are still 38 % of visitors annually, choosing to climb. This is down from 74% in 1990. Interestingly, the report goes on to say that visitors from some countries are much more likely to climb than others, although it doesn’t state which countries these are. The discussion around prohibiting the climb altogether continues to spark debate between tourists, politicians and the traditional land owners. 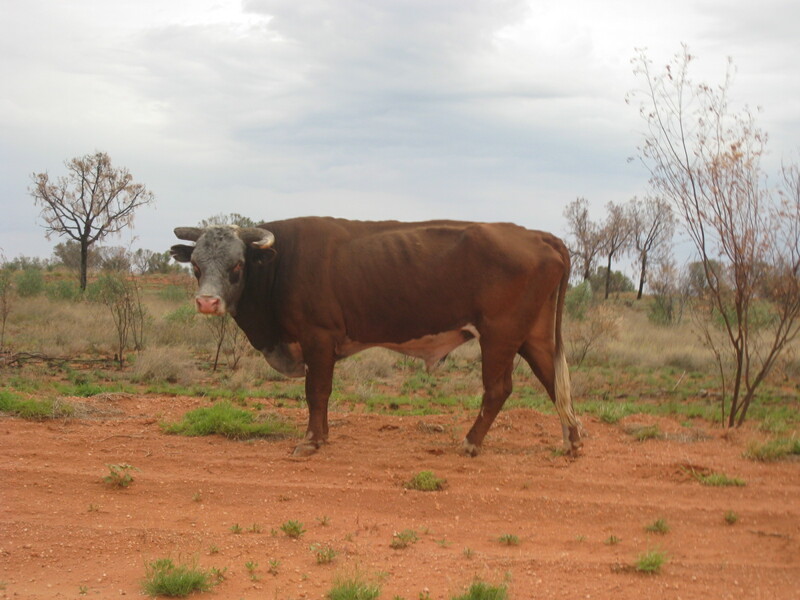 The Anangu obviously would like to see the climb stopped. The importance of the tourist industry to the Northern Territory and a potential loss of revenue is what concerns the politicians. However, a recent survey conducted for a draft management plan revealed that 98% of people surveyed would not be put off visiting the area if they were not allowed to climb the rock. One recommendation of the plan was to institute a ban once the number of climbers was reduced to just 20%. Hopefully the numbers of climbers will continue to drop and at a more accelerated rate. More and more work is being done to increase and promote cultural awareness among the general population with respect to Aboriginal culture and issues. These issues are very similar to those faced by our own First Nations people, and while much is being done, both countries have a long way to go. The link below is taken from a program called Interactive Ochre which was designed to present an Aboriginal perspective on the issues currently affecting Aboriginal people and present public knowledge concepts about cultural awareness. When I visit Uluru in the future, my hope would be to see a full ban on climbing in place and for those posts and railings to be removed. In the words of the Anangu, Palya! 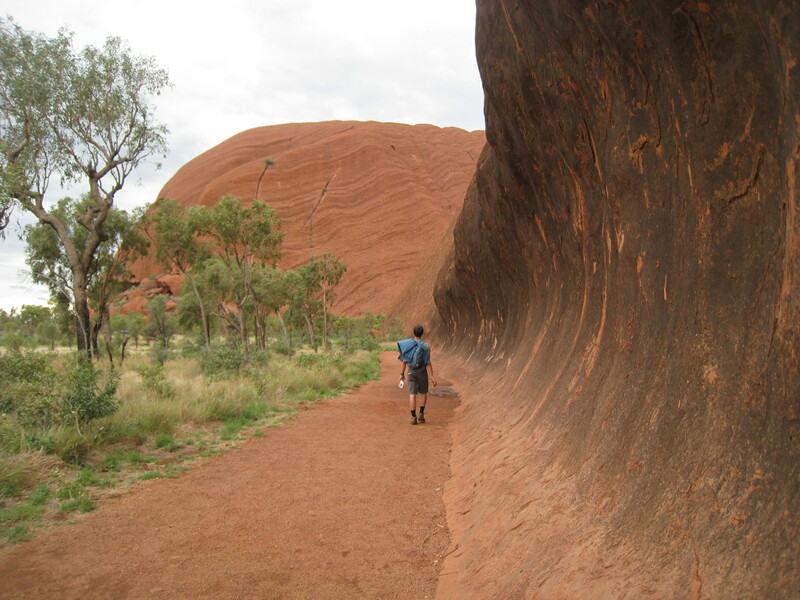 The following excerpts were taken from the Uluru-Kata Tjuta National Park Visitors Guide. Welcome to Anangu land, welcome to our home. Welcome to Pitjantjatjara-Yakunytjatjara Aboriginal land. We, the traditional owners of this place, call ourselves Anangu, and would like you to use that word too. Our Anangu culture is World Heritage listed as one of the world’s oldest human societies. Our land is home to one of Australia’s most famous natural landmarks, also recognised as World Heritage for its natural beauty. We welcome people from around the world to visit Uluru and Kata Tjuta and be inspired by these living wonders of creation. Together with many other places, animals and plants, this area is home to our sacred sites and very important to us. 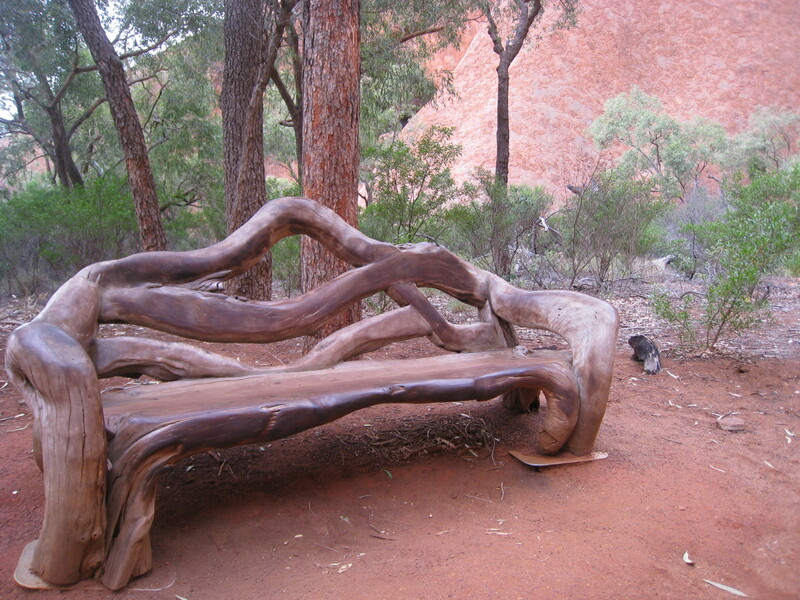 The landscape in and around Uluru–Kata Tjuta National Park is the result of nature and Anangu working in harmony. We have managed this landscape for thousands of years using laws handed down to us by Tjukuritja (creation ancestors). The marks they left in the land, also called Tjukuritja, show us the laws which were made for us to keep and live by. We call this law Tjukurpa, and to this day we manage the Park Tjukurpa katutja ngarantja, (Tjukurpa above all else). Since the land was returned us in 1985, we have been working together with the Director of National Parks to care for this place, in a process known as ‘joint management’. We hope you learn about the many animals and plants here, as well as getting to know the beautiful landscape, learning about some of the Tjukuritja, our Tjukurpa, and our Anangu way. Please respect this knowledge and open your minds and hearts, so you can really appreciate our enduring culture. Not a great photo, but if you look carefully against the clouds you can see the posts and railing. On the top part of the rock you can make out the worn path. On the bottom left are plaques left by family members recognizing climbers who had died on the rock. Last February I had the good fortune of visiting Uluru with my sister and niece during their visit to Australia. Our brief 48-hour visit to the iconic rock left a strong and lasting impression upon me. I found that leaving there tugged at the heart strings and I promised myself that I would return for another visit there one day. Stephen recently lost a good friend and colleague, Paul, due to a tragic altercation which left him in a coma. Before Stephen left his position with DND in Ottawa for this posting, Paul told Stephen to be sure to visit Uluru. Paul, himself, had never been there but he had heard that it was truly spectacular and well worth the visit. 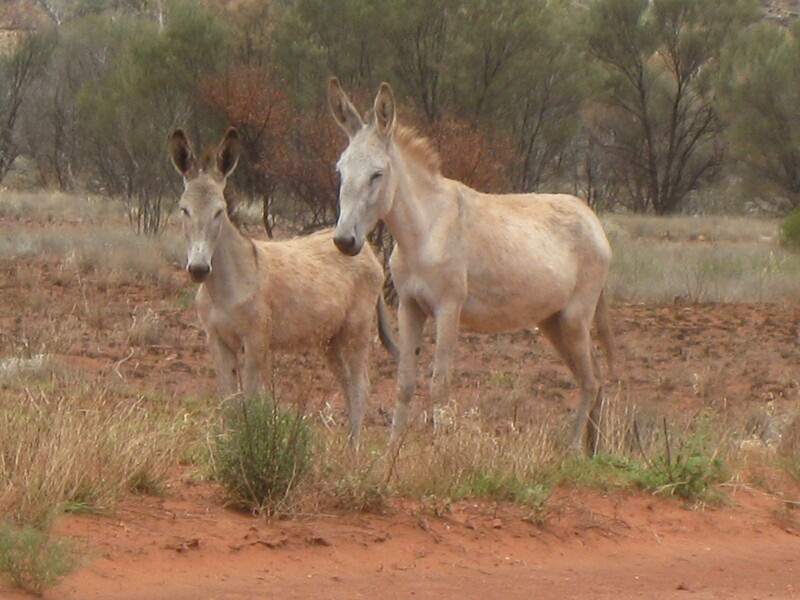 It was Paul’s senseless death that prompted us to make our recent trip to the Red Centre. When I made the trip with Sharon and Kelly, all arrangements were organized through a travel agent. It was fantastic, and included all of the standard tourist fare, with all of our transportation and accommodation issues taken care of. With that experience under my belt, I felt confident in making our own arrangements and itinerary for this visit. 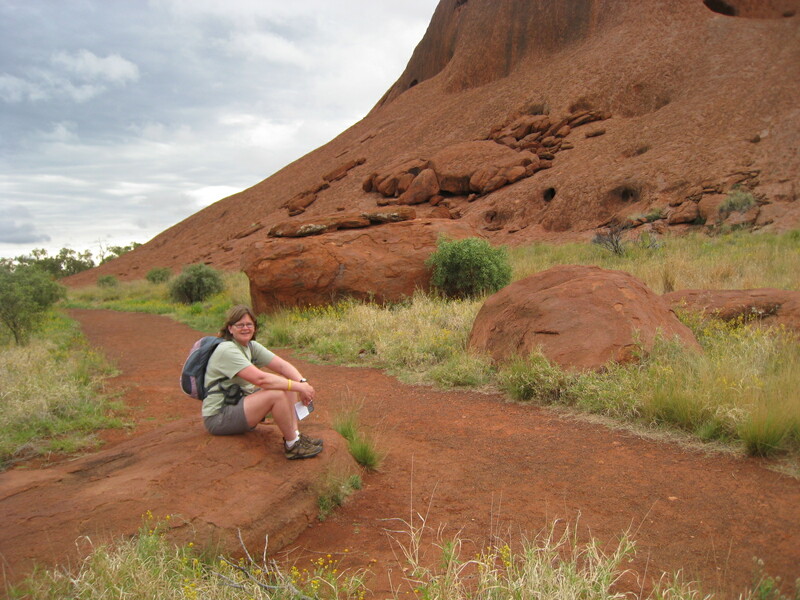 Having our own car certainly gave us a lot more flexibility and access to the Uluru-Kata Tjuta National Park. So after poking around Coober Pedy for the morning, Stephen and I set out once again on the Stuart Highway, also known as the Explorers’ Way, this time bound for Yulara and Uluru. There is not much in terms of services or civilization for the duration of the 733 km drive, except for five roadhouses offering gas, instant coffee and limited food options. The trip, therefore, involves seven hours of driving, with five quick stops on top of that. So we arrived at our Yulara accommodation, the Outback Pioneer Hotel and Lodge, early that evening. After a quick meal on the barbee, we settled down early in order to be up the next morning before the sun. Our alarm was set for 4:30 am or some such ungodly hour, in order to be at Uluru, settled into a premium spot to watch the sun come up. The weather was slightly overcast with showers, so while the sunrise wasn’t as apparent as on a clear day, it was still breathtaking to watch the dark image of the monolith come into daylight. By 7 o’clock, we were heading back to the hotel to catch a couple more hours of sleep. The rest of the day, though, was full on. We were back at Uluru-Kata Tjuta National Park by late morning and stopped by the Cultural Centre first to get a lay of the land. We then spent the entire afternoon meandering clockwise around the entire base of Uluru, a 10.6 km moderate walk plus some additional side paths to visit some waterholes and caves. We certainly took our time, stopping frequently for photos, a picnic lunch and water breaks. On extremely hot days, an afternoon walk around the base would most definitely be out of the question, but we had perfect desert hiking weather with some cloud cover and the occasional sprinkle of rain. The hike was a definite highlight, providing us with the opportunity to see the different formations of rock up close and the ever changing shape it takes on from every angle. Our walk took us into early evening, so we then drove to one of the recommended spots to watch the sunset, and sat waiting and watching for the transformations that come over the rock in the changing light. It was made even more spectacular as, while the sun was setting over Uluru, lightening was striking over the neighbouring Olgas, the enormous rock domes to the east of Uluru. It is difficult to put into words, but there definitely is a powerful, spiritual energy which emanates from the sandstone rock. And, it would seem, that the more time I spend there, the more attached to it I become. Not surprisingly, the Uluru-Kata-Tjuta National Park has been identified as a World Heritage Area, and is one of the few properties in the world to be dual-listed by UNESCO for its outstanding natural, as well as cultural, values. Already identified for its spectacular geological formations and natural beauty, in 1994 it became only the second site in the world to be acclaimed for its cultural significance, honouring the belief systems of the Anangu people, the traditional owners of the land, as one of the oldest human societies on earth. The title deed to the land was rightfully returned to the Anangu people in 1985 by the Australian Government. 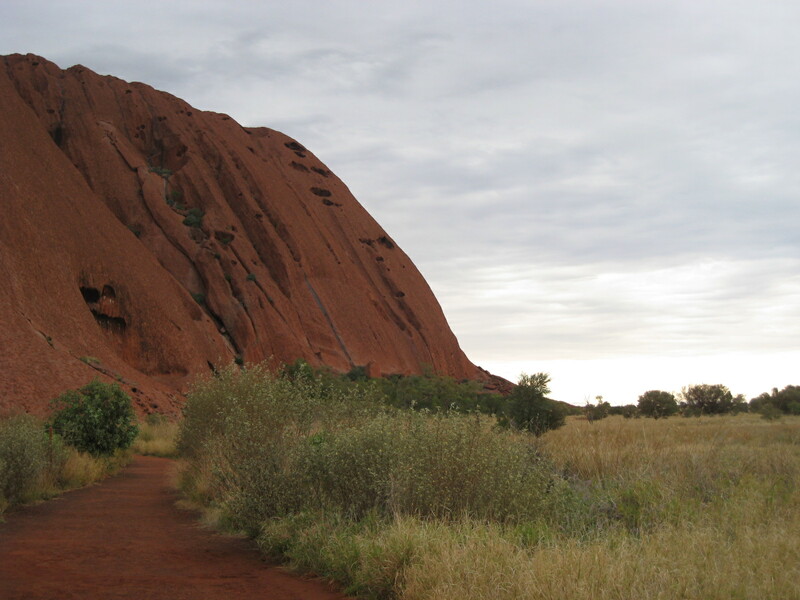 The land is now leased back to the government for a term of 99 years and is managed by the Board of Management, a 12-member delegation with the majority of board members being Indigenous persons nominated by the Anangu traditional owners of the park. Again, it was with some sadness that I left Uluru that following day. It will always hold a special place, both in my heart and in my memories. It would be nice to return to it again some day, but if that doesn’t become a reality, I will be forever grateful for having been able to visit it twice and to be provided with the opportunity to embrace its ancient spirit. As the day fades away. 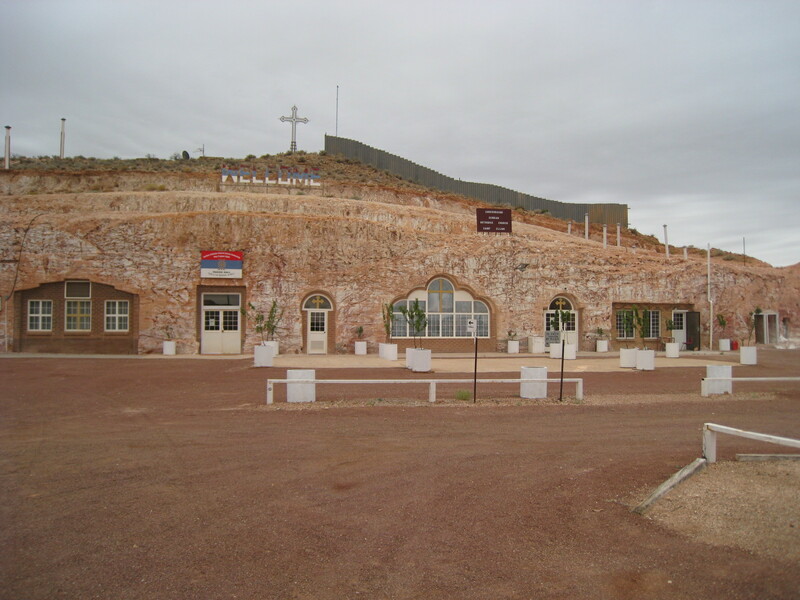 In the heart of the South Australian outback lies the frontier town of Coober Pedy. As a team mate of mine described it, a town that is both “ugly and fascinating”. 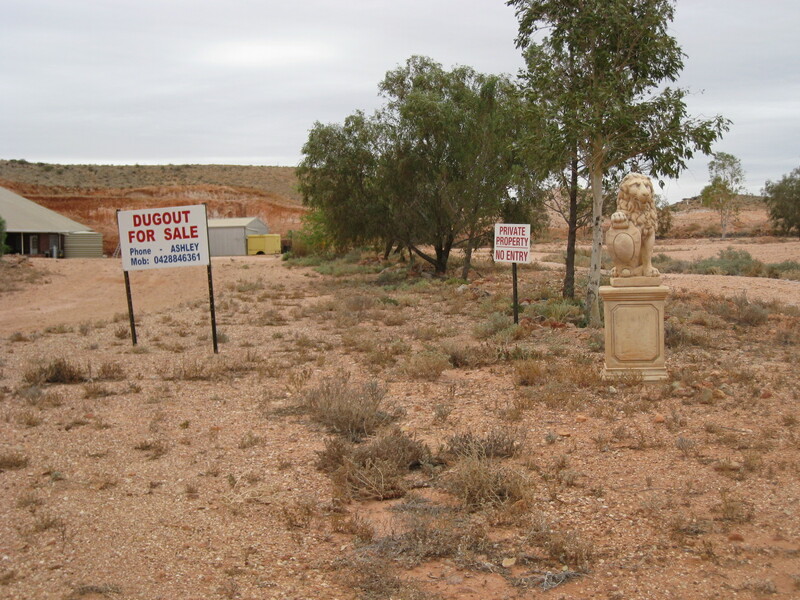 Coober Pedy is an opal mining town, supplying 70 % of the world’s opals. With a present day population of 3,500, it boasts approximately 45 different nationalities, as well as a large aboriginal community. Opal was first discovered here by a 14 year-old boy in 1914, but due to its remoteness and harsh living conditions, it was slow to boom. Things picked up in the 60’s as a huge influx of European migrants started arriving, intent on making their fortunes. They came, and even more surprisingly, stayed, and still today account for the unique, multicultural community in the middle of the desert. Walking up and down the aisles of their small IGA, I was both surprised and impressed with the huge selection of international foods they stock, a broader selection than most urban grocery stores. 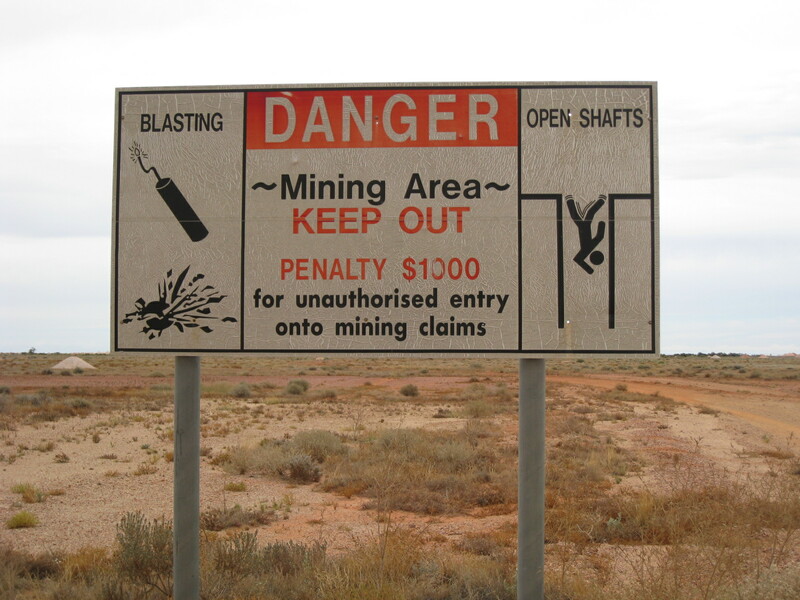 Coober Pedy has been a priority item on Stephen’s bucket list since his arrival in Australia 20 months ago. For me, though, it ranked highly as a destination that I would prefer to avoid. Due to the fact that it is approximately half-way between Adelaide and Uluru, with very little else along the route, his dream came true on our recent trip to the Red Centre. 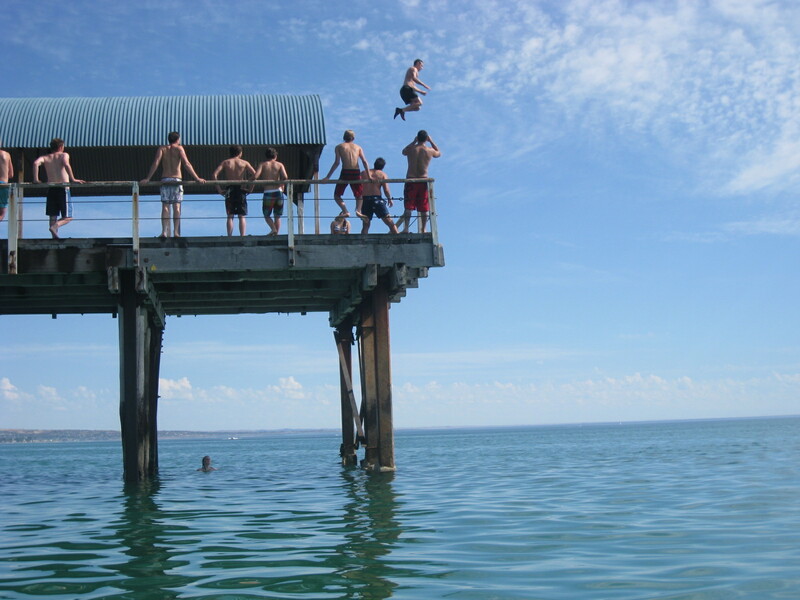 840 kms from Adelaide, it offers a unique range of accommodations for road-weary travellers. Really unique accommodations. Most of the town is built underground to escape the desert heat. Underground dwellings remain a constant 24 degrees year-round, with no need for air-conditioning or heating. So on that first night of our road trip, we stayed at the Desert Cave Hotel, in one of their underground dug-out rooms. We poked around town a little bit in the morning before heading off to Uluru, some 735 kms northwest. We visited opal shops, underground churches, stopped by the Big Winch for photos, and marvelled at the local golf course. The entire land, for as far as the eye can see, is flat, barren and dotted with large holes bored into the ground and accompanying piles of red dirt sitting beside them. Francesca was right, it truly is both ugly and fascinating. And it really does look and feel as if you’ve landed on the surface of the moon. That was supposed to be the total extent of the Coober Pedy portion of our trip, a chapter that I was glad to be finished with. As we drove away in total bewilderment and awe of what we had just experienced, I humbly (and silently), patted myself on the back for having had Stephen’s wish appeased without too much hardship on my part. However, Qantas had different plans for us. While we were visiting Uluru, Qantas management decided to lock out all of its staff in a heavy-handed gesture that was intended to send a message to its union leaders. All flights were grounded, including the one that our friend Noeline was supposed to be taking that next day to Alice Springs. The plan was that after visiting Uluru, we’d pick Noeline up in Alice and she would then accompany us for the remainder of our Red Centre travels. 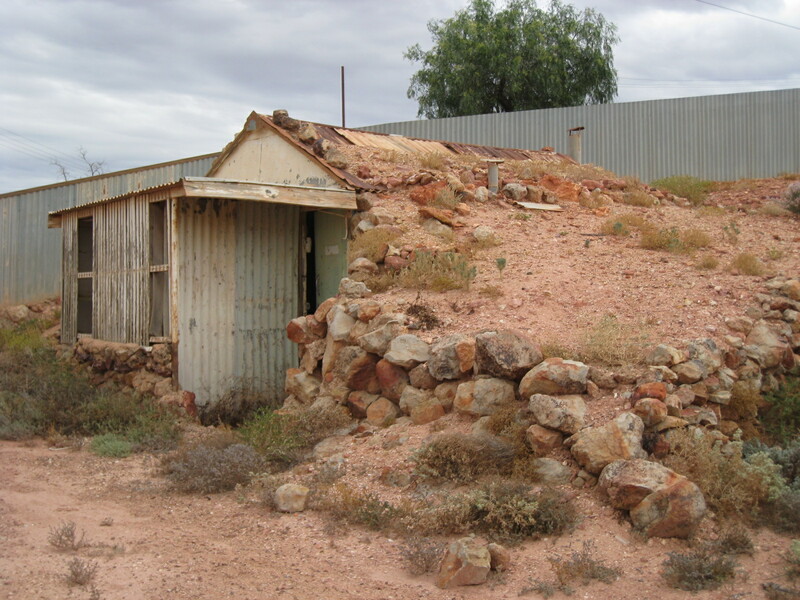 Some hasty Plan B arrangements were put in place over the phone, and as it turned out, Noeline was able to get a Regioanl Express flight to, none other, than Coober Pedy! (Did I mention that they have an airport?) So no sooner had we left Coober Pedy, than we were on our way back there. How lucky can a girl be? This time, instead of staying at the overpriced underground hotel, we stayed above ground at The Mud Hut, a nice little suite with walls actually made of Red Centre mud. (It really was a nice place to stay, I’d highly recommend it). So, I can honestly say that I have spent more time than is really necessary in Coober Pedy. I have to admit that it is worth a visit, particularly if you happen to be in the neighbourhood. Without a doubt, though, it is the strangest place I’ve ever seen- so strange that it has to be seen to be fully appreciated. 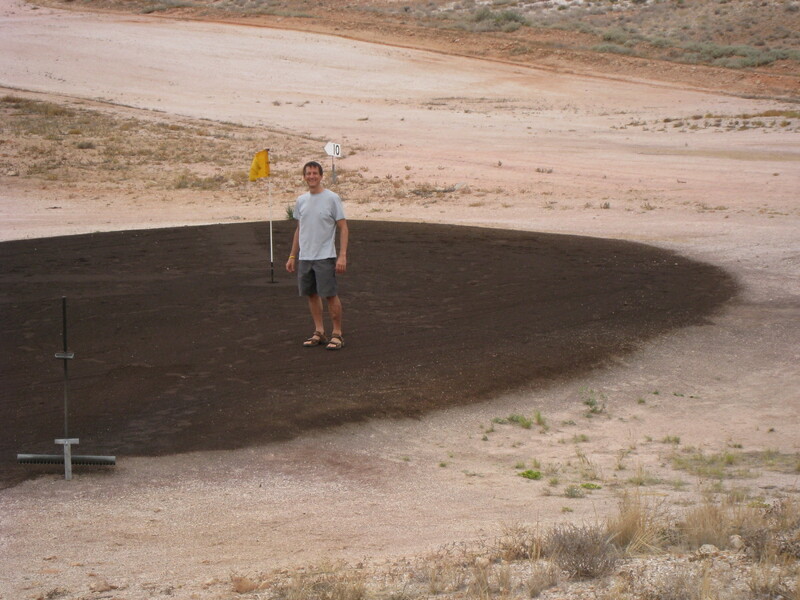 Stephen grooming the greens at the Coober Pedy Golf Club. The greens consist of sands mixed with stump oil to hold it down. Golfers carry around a small square of astroturf to tee off from. 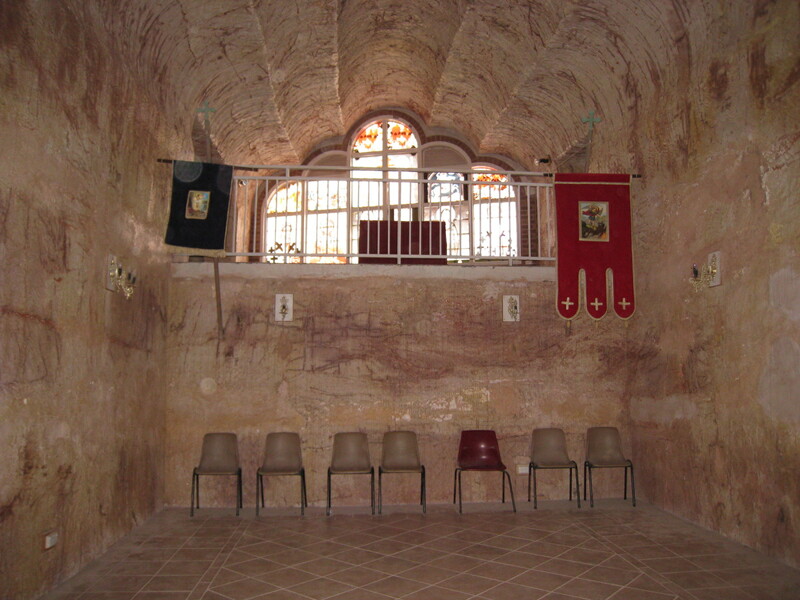 The underground Serbian Orthodox Church. The entire inside is carved out of the stone and sand, with a domed ceiling and carvings made within the walls. Inside the Serbian Orthodox Church. The Big Winch...that's winch...with an i...not an e.
Entrance to an underground home. 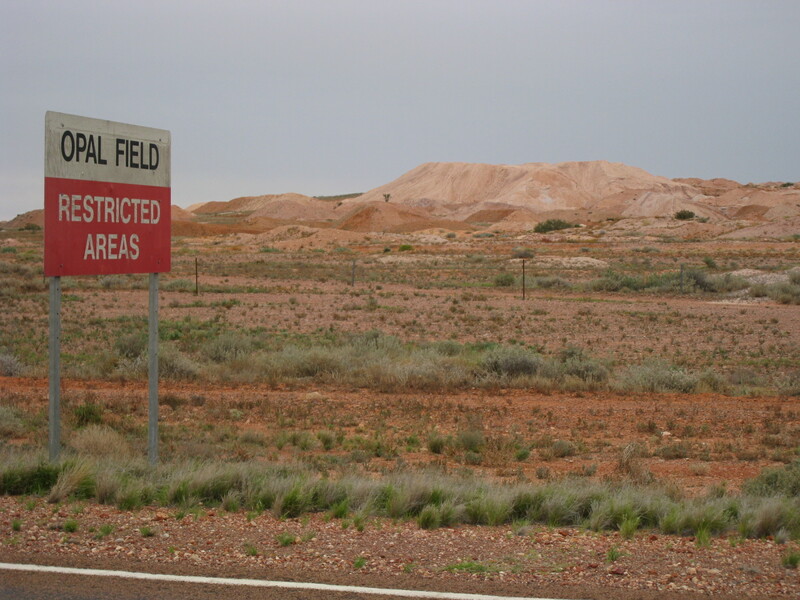 At one time, tourists were able to walk through the opal fields, but too many disappeared down the deep shafts, so the fields are off limits now. Instead, there are guided tours offered through some of the mine operators. 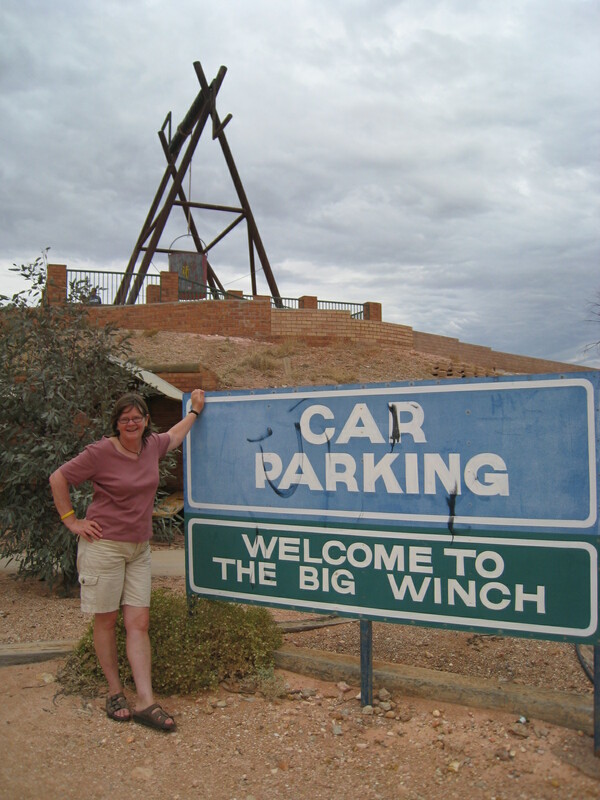 We’ve recently returned from an 11-day, 5600 km road trip to Central Australia, an area referred to as The Red Centre. It was an amazing trip, with lots of sights and stories to share. This post will be the first of several that will chronicle our most recent adventures. We had great weather- some rain while we were driving and some sun and heat while we were hiking and touring. 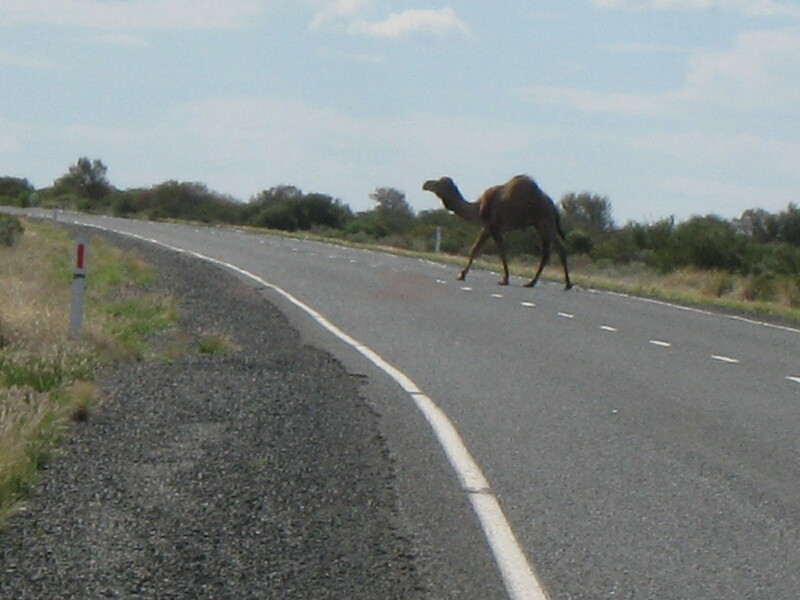 The rains brought animals from the bush to the road side where they were able to drink from the pools of water on the bitumen (aussie for asphalt), and the combination of rain, heat and sunshine provided more than the typical amount of desert vegetation. The desert is as fascinating and breath-taking as the coastline, offering spectacular vistas of rugged terrain, including mountains, canyons, gorges and miles and miles of endless roads and desert scapes. Most of the land we travelled through was Aboriginal owned and, as such, was full of ancient culture and history. The journey was every bit as spectacular as each of the destinations. Without going into a lot of description, here are some images of things we came across while driving, things that are unique to, and typical of, The Red Centre. 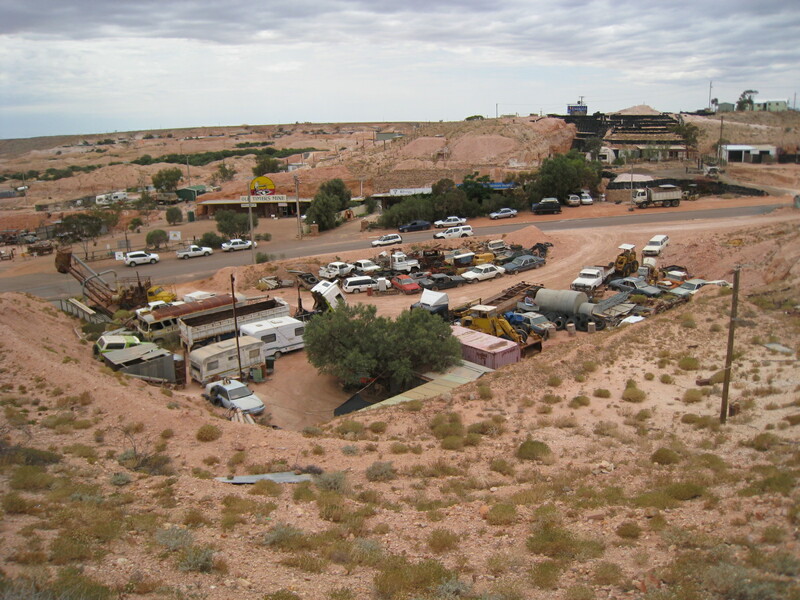 Heading north from Adelaide, the Stuart Highway took us through the opal mining town of Coober Pedy. That place is worth a blog post in itself! More later. 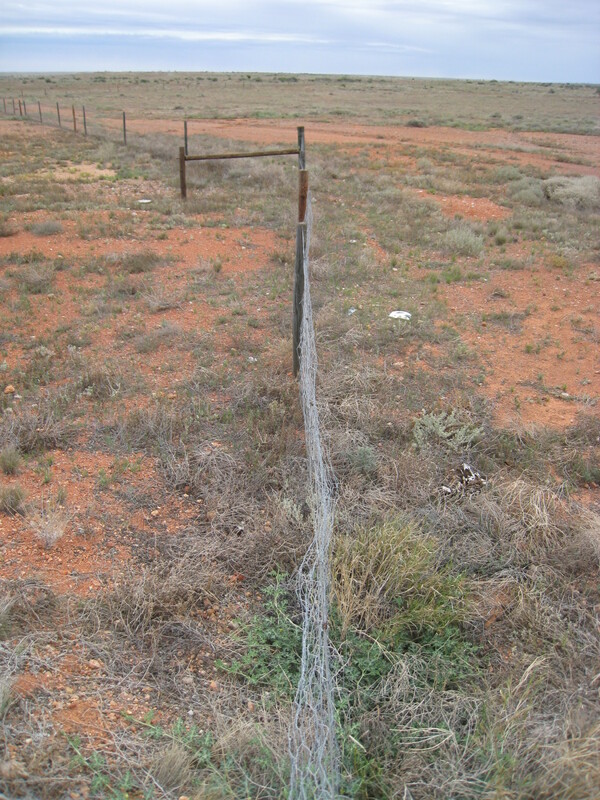 Just north of Coober Pedy we passed through the longest fence in the world. It stretches 5300 kms from Queensland to western South Australia. 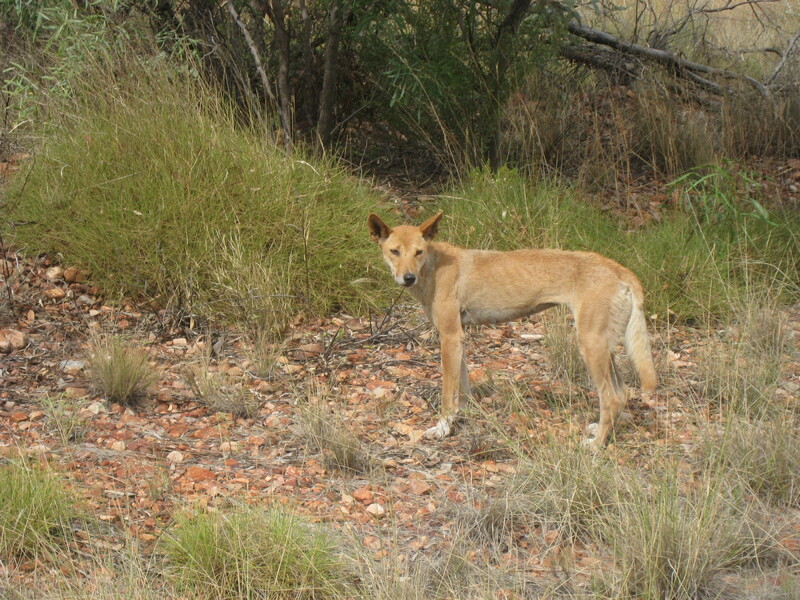 It separates the rich sheep-growing areas in the south from the dingoes of Central Australia. 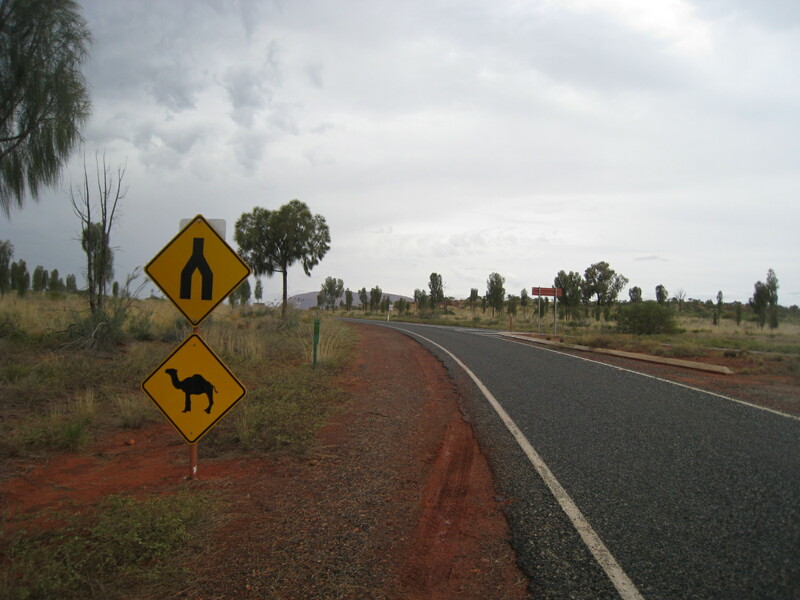 The Stuart Highway is the principal north-south route through central interior Australia. 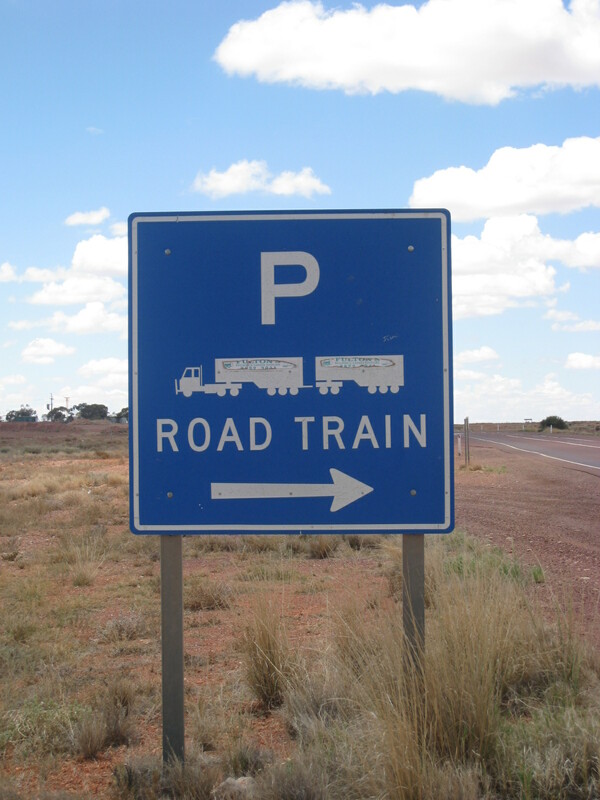 It runs from Port Augusta in the south to Darwin in the far north, passing through Alice Springs in the middle. 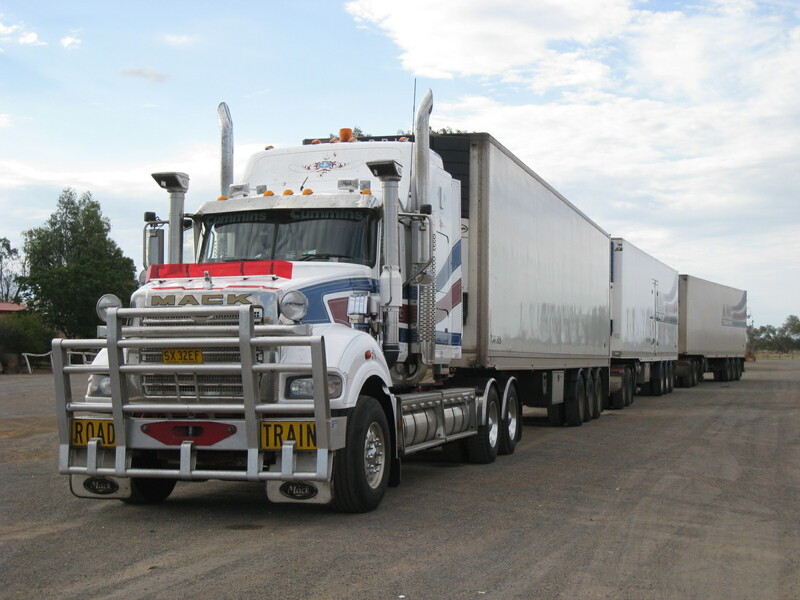 Road trains, such as this triple car one, use the highway to transport goods between the north and south. 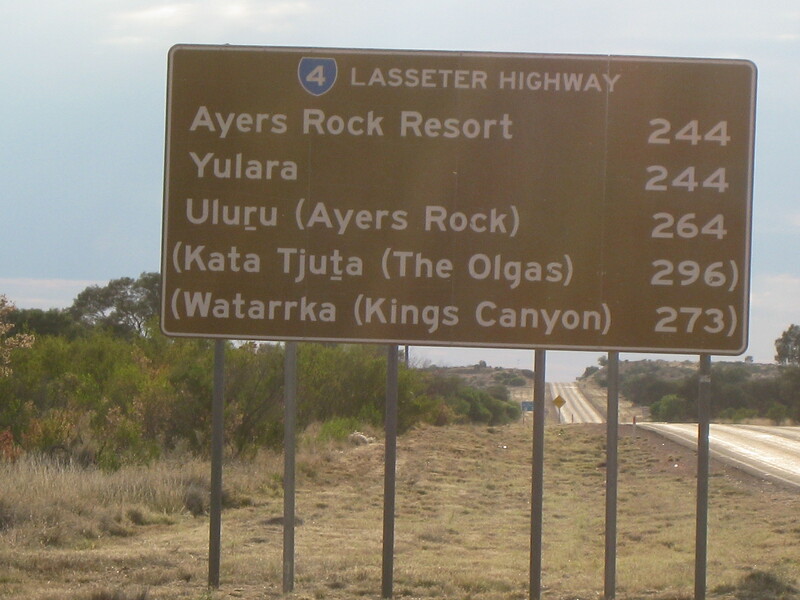 We also passed by a ” quad” road train carrying fuel cars on the Lasseter Hwy heading towards Yulara (Uluru). Without a doubt, though, the most worrisome sight we came upon was the start of a bush fire alongside the Stuart highway. From a distance, we had assumed that it was a controlled, prescribed fire, but as we got closer we realized that it wasn’t and it appeared to be spreading quickly. Ahead, a trucker had pulled off to the side of the road to call the authorities. Meanwhile, Stephen and I had grabbed our cameras, while Noeline, our friend and guide, was beside herself because the stupid Canadian tourists she was travelling with were sitting in their cars next to an out of control bush fire trying to take pictures. Realizing our foolishness (with her help), we put the cameras away and were heading away from the fire, but as we passed the trucker on his phone, he asked us to drive back past the fire to note the closest crossroad. So, if driving past the fire the first time was scary, driving by it the third time was absolutely terrifying. We did slow down and tell the trucker the name of the crossroad and then quickly headed away from the scene. Part of moving to a new city involves sussing out local services and amenities, such as doctors, dentists and hair stylists. While I’ve been away, I’ve tried to put off doctor and dental appointments until I get back home, unless absolutely necessary. That is mostly due to the complication of having out of country coverage and the hassles and delays of submitting referrals and receipts. Now, while you don’t need coverage or referrals for a haircut, finding a hairstylist that you are comfortable with and that doesn’t require a bank loan, can be just as daunting an endeavour. Canberra worked out well for me from that respect. First of all, I left Canada with a cut that would buy me some time before I’d have to have it cut again. When I did finally need a cut, I tried the closest place to home, 2 blocks away, and while it cost considerably more than in Canada, I was more or less pleased with the final outcome. 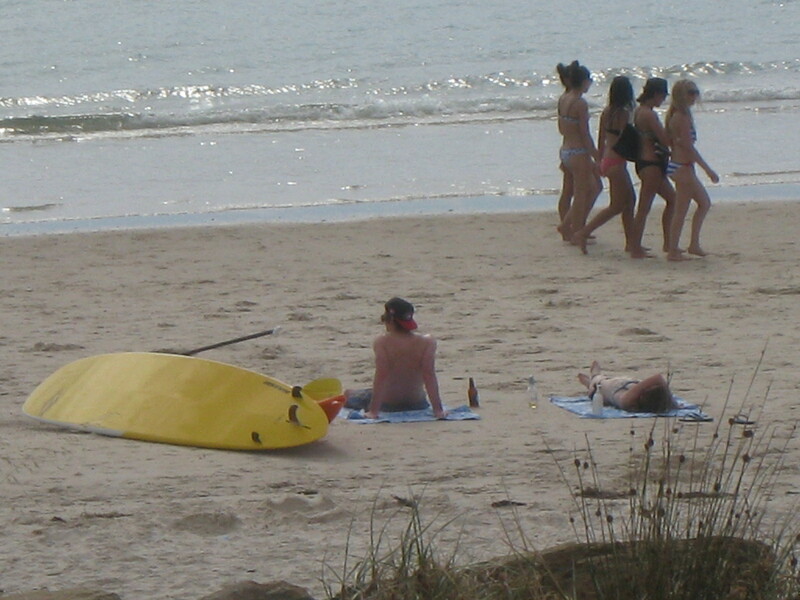 Even better, though, was meeting my Kiwi paddling friend, Sandy, who was a professional hairstylist in Christchurch until she hung up her scissors and moved to Australia. Sandy gave me great cuts because she knew me personally and knew my tastes and preferences. She wasn’t prepared, though, to move to Adelaide with me, so it was back to square one. The first place I tried out was Beach Street Hair, a salon close to home and I really liked their name. I was sure that by going to an establishment called Beach Street Hair, just a block away from Grange Beach, I would come out looking like the tall, beautiful blondes I see walking along the beach. A Canadian version of Elle MacPherson. Surprisingly, that didn’t happen. Perhaps because I got a junior stylist (with senior stylist prices), who cut my “fringe”, (Australian for bangs), hideously short. The good news that comes with having a hideously short fringe, though, is that it buys you a lot of time before you have to go for another cut. So when Kate came to visit in July, and needed a trim, all I could tell her was where not to go. She ended up going to a great little salon right in Henley Square, called Main Street Hair. To make a long story a little shorter, that’s how I came to know Noeline. I eventually went to the same salon, and got to know the owner, Noeline. With a range of similar interests, we have since shared many sunsets over wine on our porch, and I’ve been fortunate enough to go on some wonderful hikes with her. 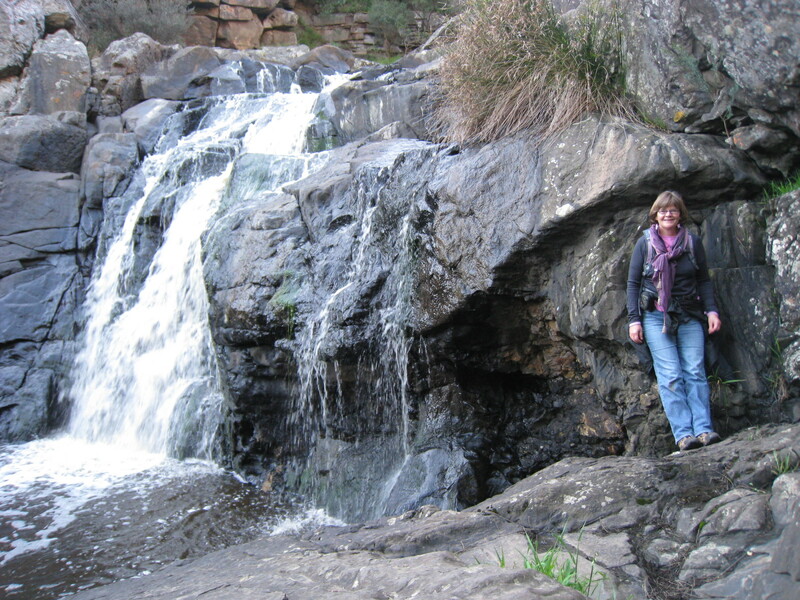 Noeline has travelled widely, is an enthusiastic outdoors person and a trained bushwalk leader. 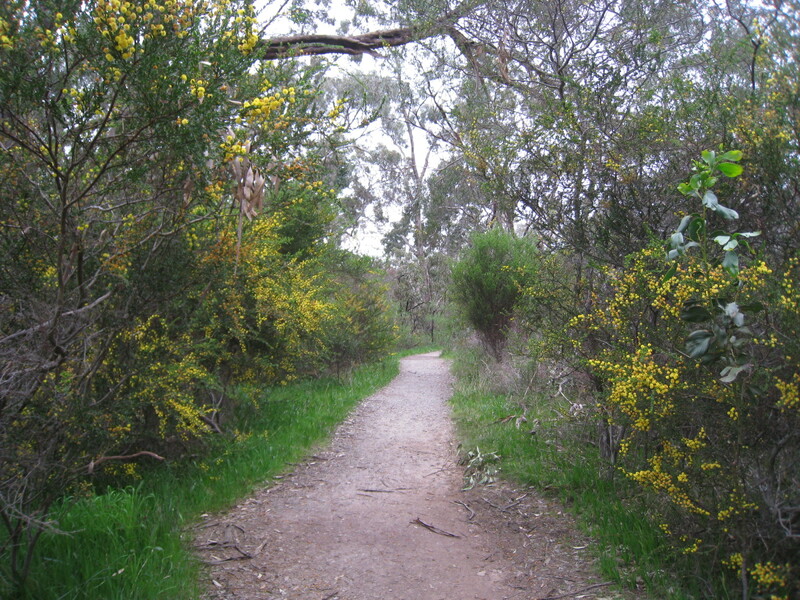 She has taken me on hikes along parts of the Heysen Trail in Deep Creek Conservation Park, on the Fleurieu Peninsula, southeast of Adelaide. On another day trip we hiked through Belair National Park in the Adelaide Hills, where we came upon 4 koalas in the wild, squawking/chattering high above us in the eucalyptus trees (they make a very strange noise which I’m not sure what to call, but that is how we came to know that they were even there). 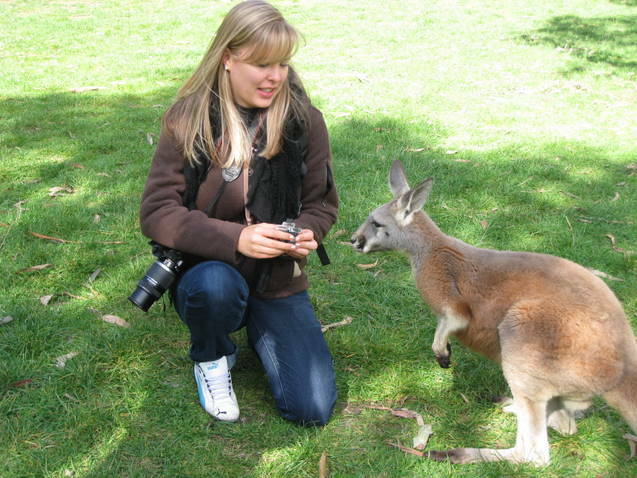 Next week, Stephen and I, along with Noeline, will embark upon the most amazing Australian adventure. Stephen and I will be driving north to Uluru, and from there we will drive to Alice Springs to meet Noeline at the airport. 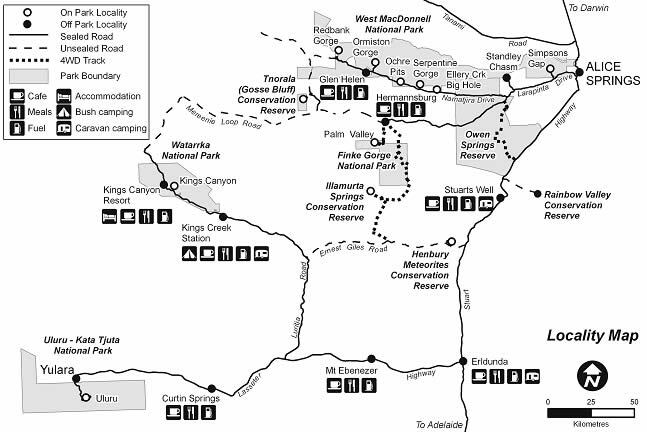 With her help, we will then travel through both the West and East MacDonnell Ranges, hiking gorges, bluffs, canyons and creeks in Watarrka National Park, Finke Gorge National Park and MacDonnell National Park. We will be staying in various bush camps and hostels before heading back home by way of the Oodnadatta Track, an unsealed track through the Simpson Desert that follows a traditional aboriginal trading route. This route will take us by Lake Eyre, the lowest point in Australia and when full, is the largest body of water in the country. This year’s rainfall marks the first time in 30 years that the lake is full, and as we are told, is a must to see. This is a massive distance to cover, and much of it through desert and unsealed roads, navigable only with a 4WD. We are hoping to do it all, or at least as much as we can, in 10 days. We have stocked up on supplies, especially fuel and water. It is as outback as you can go. I am told that we will see lots of examples of rock art along the Oodnatta, and pass through Aboriginal communities where I am hoping to buy some traditional artwork to take home. We’ll be off the grid for a while, but if you haven’t heard from me in two weeks time, send out the Rangers! Lightweight and petite, Icky stands approximately 7 centimetres tall and weighs in at a whopping 50 grams. It tucks perfectly into the palm of a hand, a pocket or a purse. It appears to be made out of 100% acrylic (partly clear and partly granite coloured), and is iconically Canadian! Icky, you see, is a pint-sized replica of an inukshuk, and I was honoured to host Icky on its recent trip downunder and play tour guide for the duration of the visit. It was a big event, almost as big as Oprah’s visit, and one I took very seriously. I tell you, I was all over this mission. Upon reading Leigh’s letter, it was clear to me that she knew her stuff. 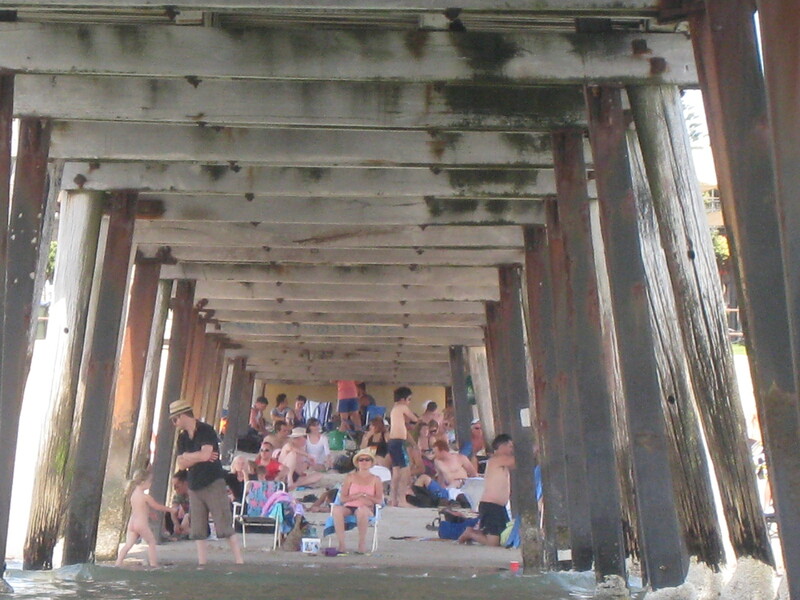 There are some obvious images that jump out at you when you think of Australia, for example, bridge. While we saw and walked on, under and over many bridges (especially in Brisbane), there was no doubt in my mind that the bridge had to be the Sydney Harbour Bridge. It became my responsibility to steer these tourists in the right direction so that only the most iconic symbols and sights would used for this mission. Icky’s trip included Melbourne, then onto Adelaide (by way of the Great Ocean Road), Brisbane and finally, Sydney. I travelled with the group to all of the above, with the exception of Sydney. By the time we had parted ways in Brisbane, we had successfully managed to capture Icky on film with most of the items on the list. The remainder were to be taken in Sydney, where they were to spend 3 days before heading back to Canada. Leigh, thanks so much for entrusting us with Icky. 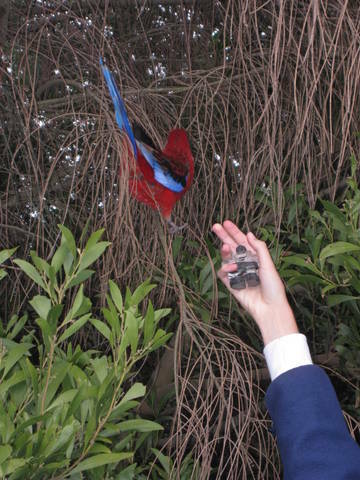 He, (I obviously became too attached to the little fellow as I now always refer to it as a living being), added to our adventure and we had great fun trying to explain our mission to the Aussies whenever we had to request a special pose. I’d like to think that we furthered their understanding and appreciation of the Canadian icon, but I’m not positive that they understood what we were talking about. Blame it on our accents, I guess. Nevertheless, no one refused our request to have a picture taken of them with Icky. I trust that Icky returned home safe and sound. 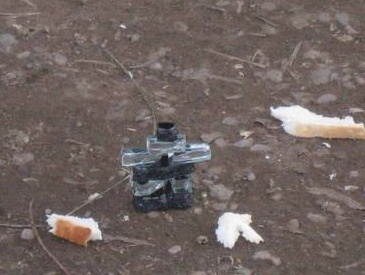 It really was a great adventure, if only that little acrylic guy could talk… Hopefully the photos will speak for him. I’ve included a few that I had taken of him, but I must remind you that I was not the official photographer, just the tour director. I hope that you enjoy them.